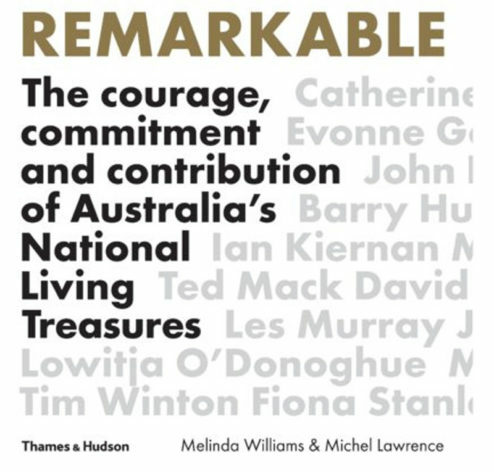 Remarkable, the book detailing the stories of the 100 National Living Treasures has been listed by The Australian Financial Review’s Summer Magazine as one of the Best Books of 2018. The Magazine listed 17 books in its ‘Best Books’ review for the year, including 5 illustrated books in its compilation. ‘Remarkable’, written by Melinda Williams and photographed by Michel Lawrence was published by Thames and Hudson. 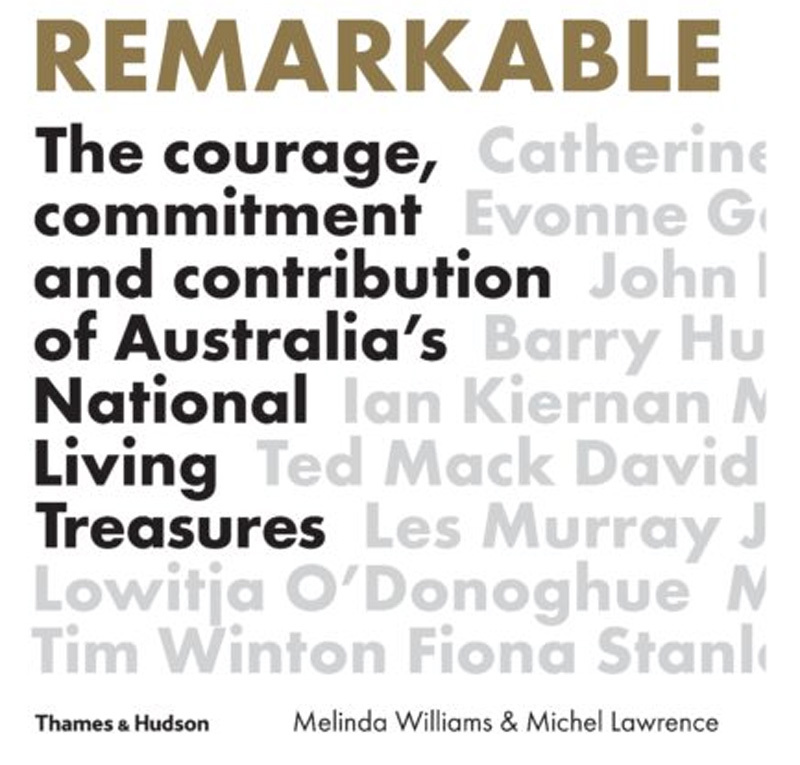 “Melinda Williams has interviewed and collated the stories of more than 100 of Australia’s National Living Treasures, selected in 1997 by public vote for this wonderful book. Gifted photographer Michel Lawrence did the portraits. There are people from the arts, politics and science, the professions and the sporting world; many such as Arthur Boyd, Judy Davis and Cathy Freeman are well known but there are unsung heroes as well. All have made an enormous contribution to our society and we have much to learn from them. 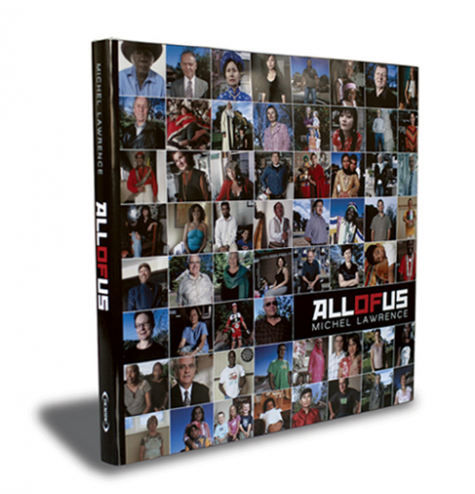 Remarkable is a large format book of 340 pages. 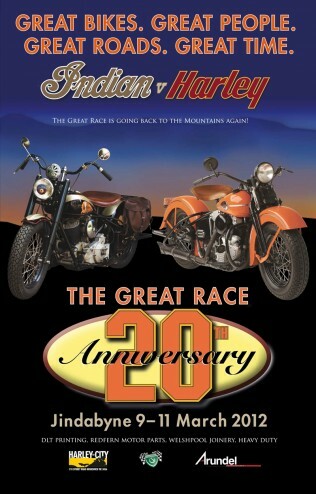 It was designed by John Canty and edited by Katie Purvis. Michel Lawrence’s Nolan portrait for new Nolan film. Michel Lawrence’s iconic portrait of Sid Nolan is the feature image for the just released, new hour-long documentary on the life of Nolan. The film simply titled, ‘Nolan’ is a joint ABC/BBC collaboration and features interviews with some of Nolan’s closest friends and relatives to unearth new and compelling stories about his life and times. 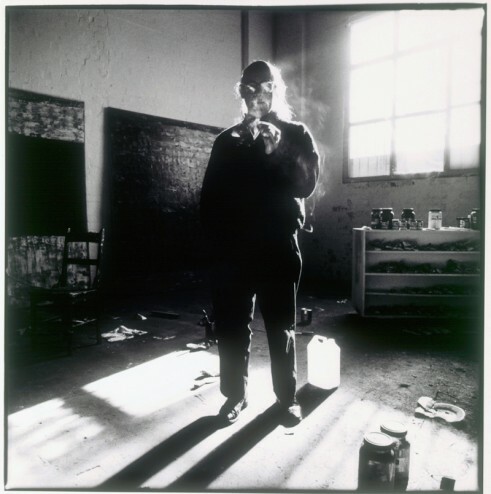 The Nolan image was taken by Michel Lawrence in 1987 at Rob Imhoff’s South Yarra studio. The portrait depicts Nolan holding a cut-out cardboard version of Kelly’s legendary ‘postbox style’ steel helmet, which featured in most of Nolan’s famous series of Kelly Gang paintings. Kelly’s armour, including the trademark helmet, was originally made with the help of local blacksmiths using old of steel from plough shares. The Kelly Gang paintings were originally produced in the kitchen at Heide, now The Museum of Modern Art at Heide. The original paintings were later gifted to the National Gallery of Australia in Canberra by the then owners of Heide, John and Sunday Reed and were the subject of a bitter dispute between the Reeds and Nolan. Nolan revisited his paintings of the Kelly Gang numerous times. Michel Lawrence’s portrait of Sidney Nolan plays homage to Nolan’s own iconic image of Ned Kelly’s mask. 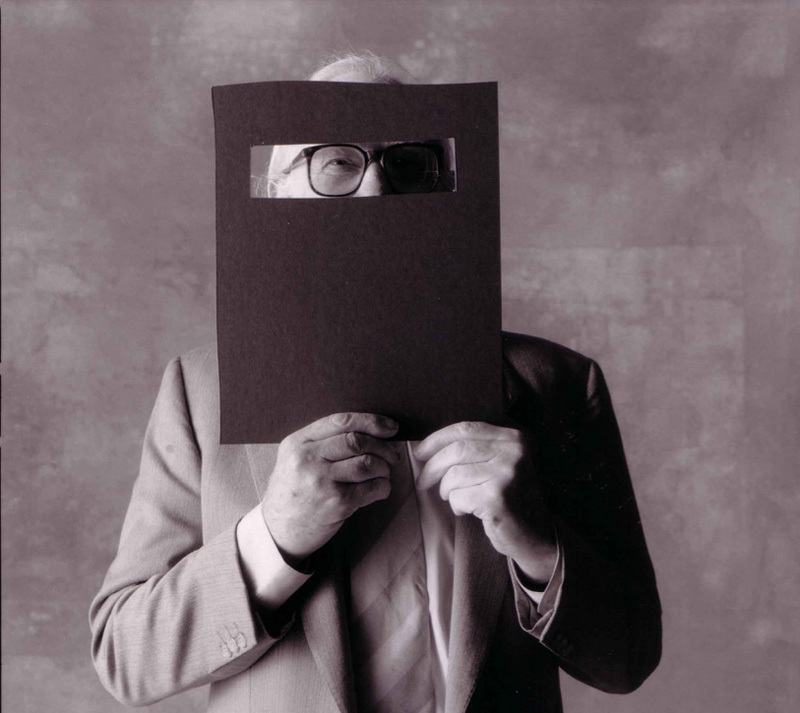 Michel’s original photo of Nolan holding the cut-out mask was first exhibited in two major exhibitions at Australian Galleries, first in Melbourne and then Sydney. 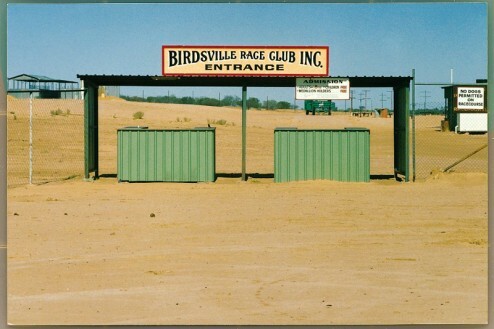 The photo was then reproduced in the book Framed – Photographs of Australian Artists, published by Hardie/Grant in 1998. The portrait was again exhibited, at The National Gallery of Australia , Canberra during 2016 with Nolan’s Riverbend series. It was then exhibited again at Australian Galleries, Melbourne, as part of a joint exhibition of John Kelly’s paintings (no relation to the Kelly Gang) which had been heavily influenced by Nolan, along with a series of original Nolan works owned by the show’s curator Dr Damian Smith. 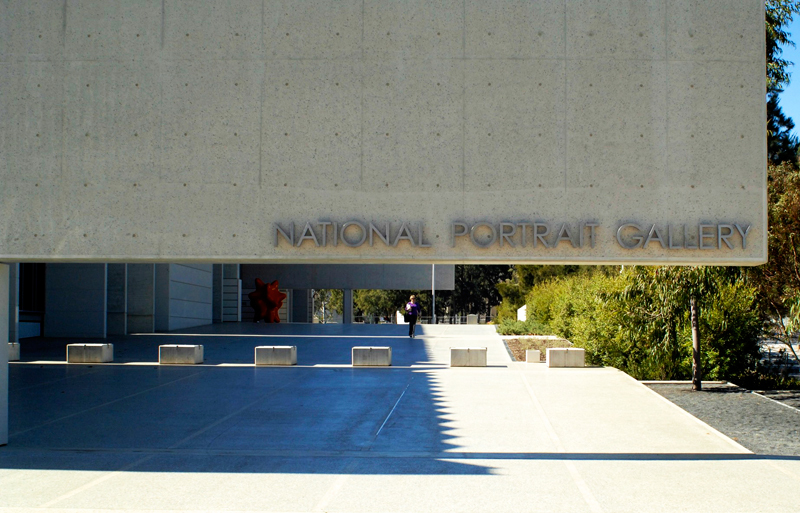 Michel Lawrence’s Nolan portrait is in the permanent collection at The Museum of Modern Art at Heide. 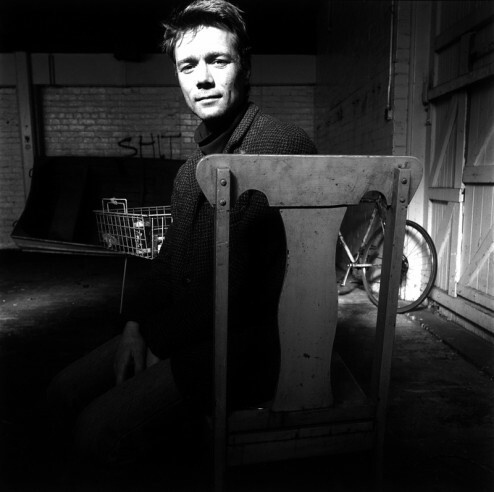 The film Nolan was produced by Flaming Star and was directed by Sally Aitken. 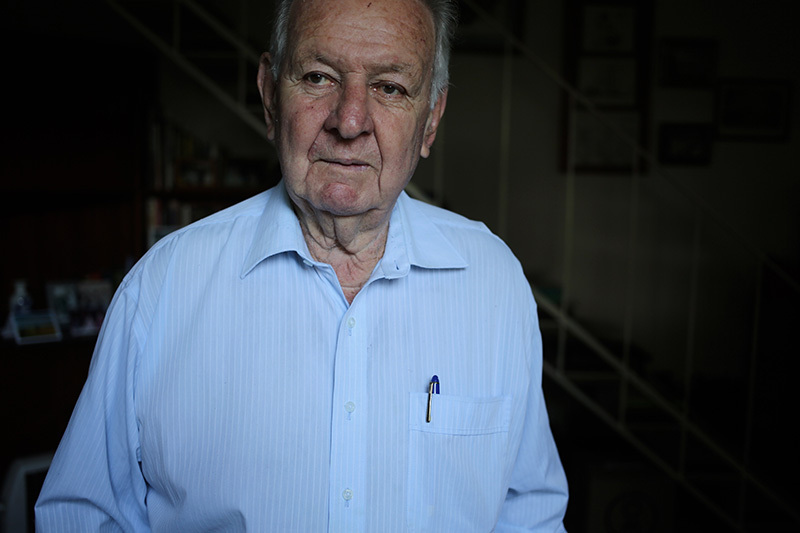 Michel Lawrence photographed the once feared and admired leader of the Sydney Builders’ Labourers Federation at his Sydney home © 2018 for the book Remarkable. Mundey was the first Unionist/Envrinmentalist leader in Australia successfuly halting redevelopment of the Sydney Rocks area. ‘Remarkable’ is Michel Lawrence’s third photographic book. 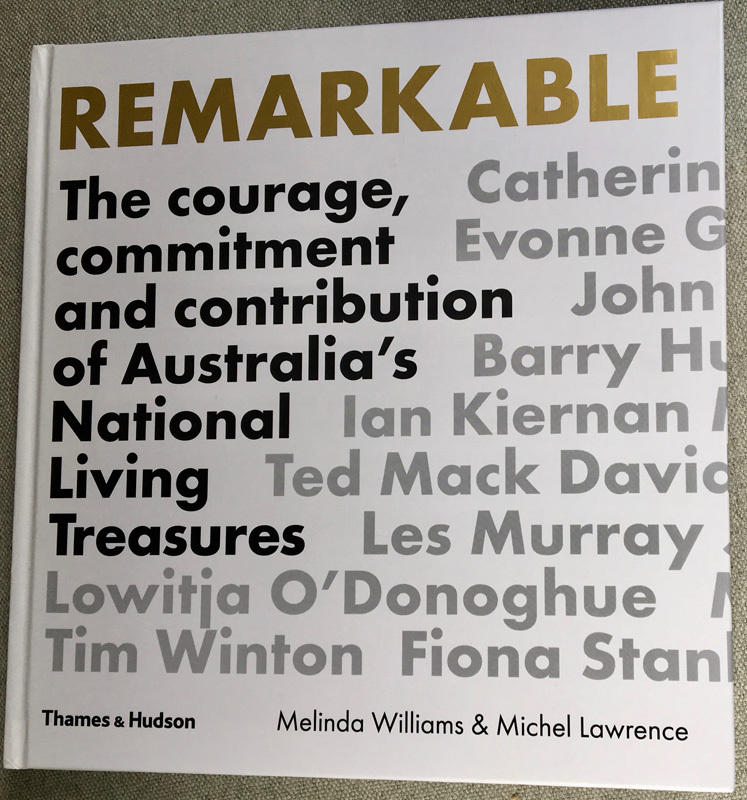 And as the title suggests it is filled with remarkable people, some very well-known, such as former Prime Minister John Howard, comedian Gary McDonald (aka Norman Gunston) the great swimmers Dawn Fraser and Shane Gould, the brilliant polymath Barry Jones and a further 95 great Australians. Some are not so well known but they were all nominated as Australia’s ‘National Living Treasures’ in an idea sponsored by the National Trust of Australia in 1997 and voted on by Australians through the pages of The Age and The Sydney Morning Herald. So these were the People’s Choice Awards if you like. ‘Remarkable’ which took nearly two years to compile was written by Melinda Williams and photographed by Michel Lawrence. 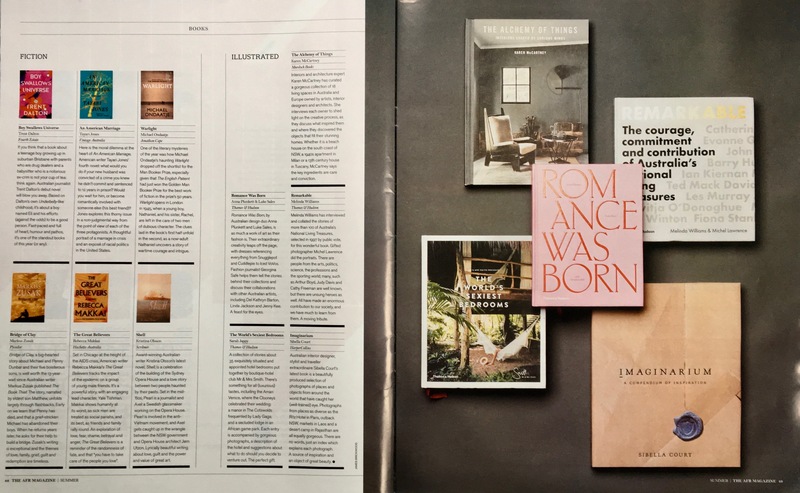 ‘Remarkable’ was published by the venerable Thames and Hudson, arguably, one of the world’s great publishers of illustrated books on Art, Architecture, Design, Photography, Fashion, Lifestyle, Music, History. 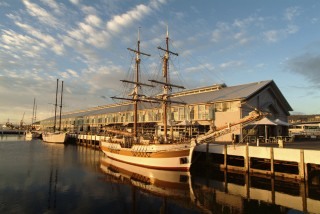 Melinda and Michel travelled across Australia meeting, interviewing and photographing the Treasures. The photographs were all shot using only natural light, as it would have made for a much larger production budget with a large crew with lights and larger format film equipment. But this meant that there was a much greater sense of continuity to the photographs and stylistically much more consistency. The portraits were largely shot in the landscape format and quite often in very close-up mode. 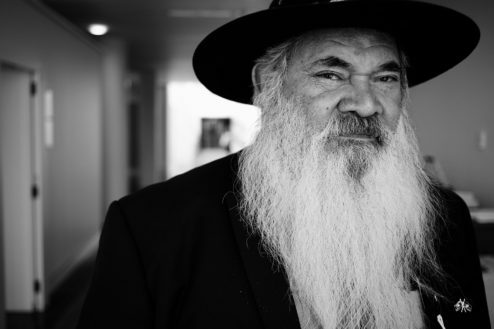 Senator Pat Dodson was photographed outside his office in Parliament House Canberra, by Michel Lawrence © 2018 for the book Remarkable published by Thames and Hudson. “They were remarkable people” says Michel Lawrence. 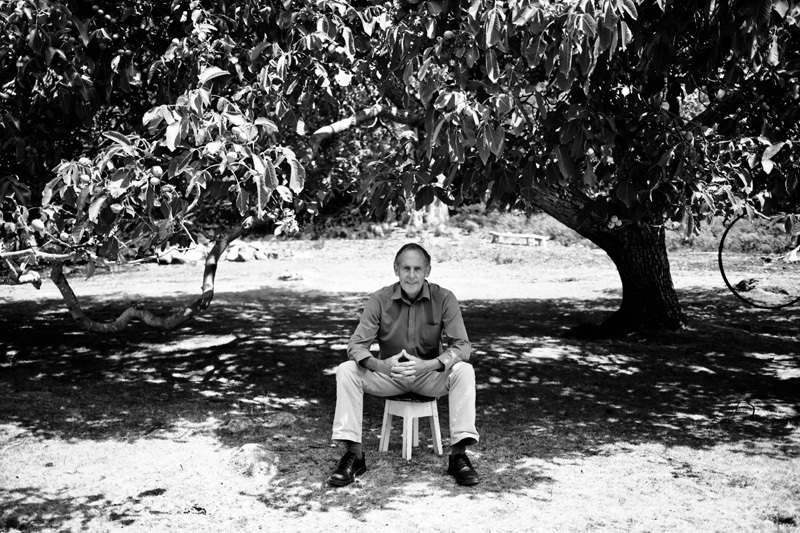 Bob Brown, the former Greens leader was photographed by Michel Lawrence © 2018 under an ancient Walnut tree on his property, Oura Oura in Tasmania for the book Remarkable, published by Thames and Hudson. Dawn Fraser is without doubt one of Australia’s National Living Treasures. The great swimmer was photographed by Michel Lawrence at her local pool © 2018 for the book Remarkable published by Thames and Hudson. Melinda conducted her interviews as the portrait sessions progressed and a video recording session was also included in the project. Unfortunately some of the original nominations could not be interviewed or photographed as they had sadly passed away. 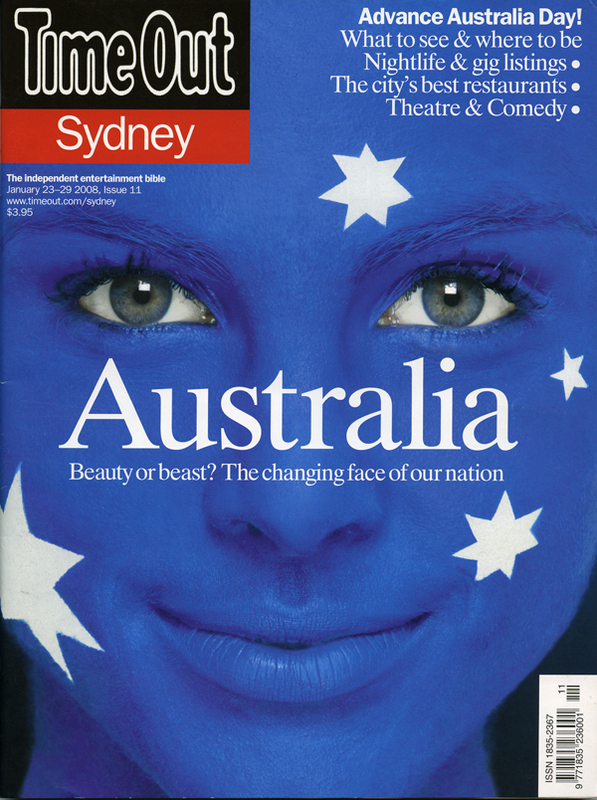 Gough and Margaret Whitlam were gone, as too Malcolm Fraser, the indigenous singer/songwriter Jimmy Little, the internationally acclaimed art critic Robert Hughes, Dame Leonie Kramer, the much loved Hazel Hawke and the great country singer Slim Dusty to name just a few. Michel Lawrence photographed the acclaimed Aboriginal actor, TV presenter and activist in Perth for the book Remarkable © 2018. Published by Thames and Hudson. So, Melinda and Michel set about the project with a sense of urgency as they wanted to record as many of the Remarkable Australians before any more passed away. By and large they were successful, as several in fact passed away after they had sat for portraits and interviews. 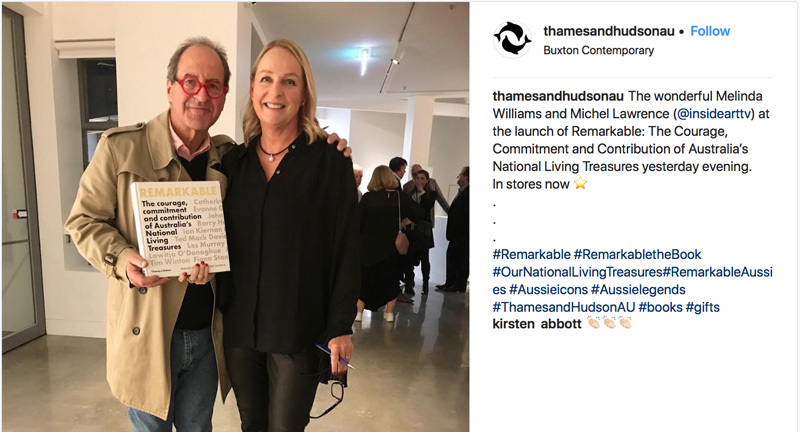 The book was launched in October 2018 at The Buxton Contemporary Art Gallery Melbourne. Remarkable was designed by John Canty and edited by Katie Purvis. 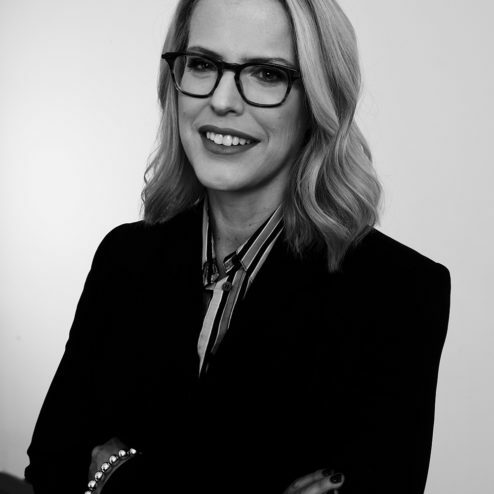 Publisher in charge of the production was Kirsten Abbott. Thirty years ago I photographed Sidney Nolan. 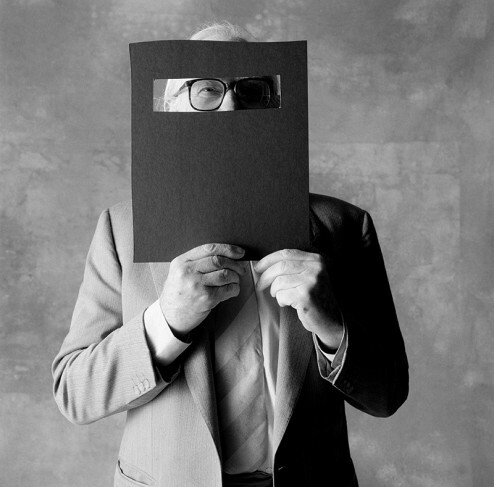 One of the most important Australian artists of the 20th Century, Sir Sidney Nolan was in Melbourne for an exhibition, and he generously agreed to a portrait which was to be taken at Rob Imhoff’s studio, The Lighthouse in Prahran. The studio was also a gallery space where in 1985 I held my first exhibition of portraits of musicians and comedians from The Last Laugh and Melbourne’s music scene. The session went well. Nolan was wearing a grey suit, a nondescript tie and shirt: “Dress like a banker!” his mother had always told him. He was relaxed and accommodating. 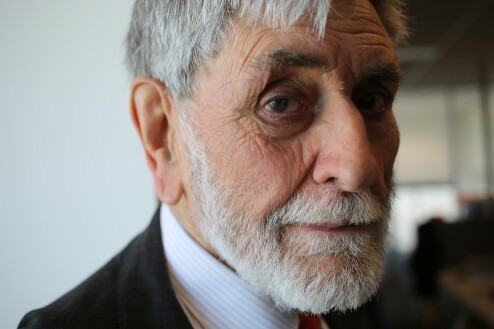 Sid Nolan pays with the pastiche of the iconic Ned Kelly helmet in this portrait by Michel Lawrence. 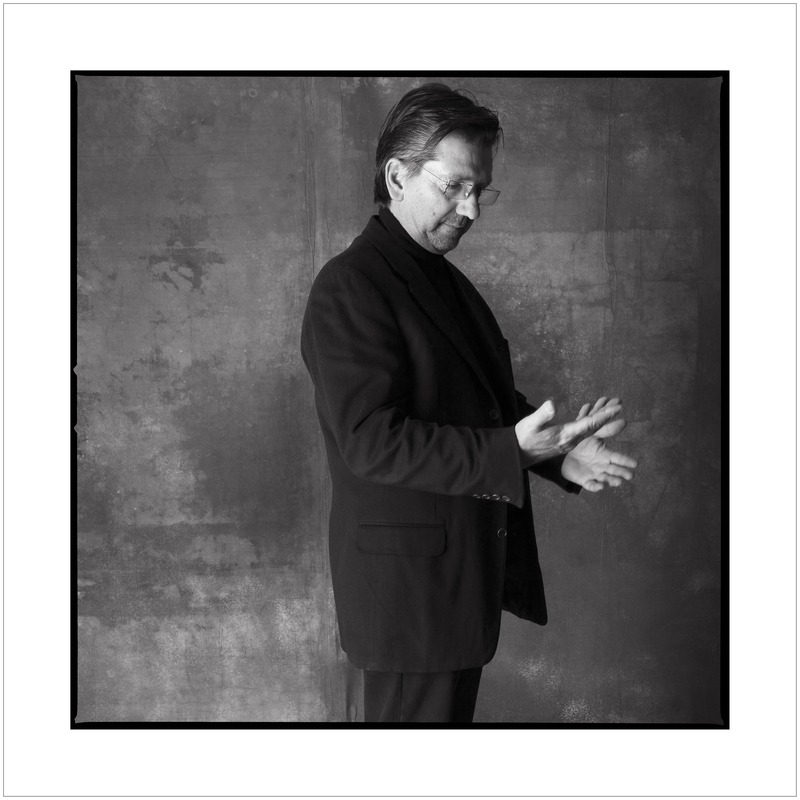 The shots taken that day were to prove important pictures, as Nolan rarely sat for portraits. With the shoot a very relaxed affair, I took the opportunity to mention to Lady Mary (Sidney’s was knighted in 1981), who was with us in the studio that I was living at 38 Wentworth Avenue in Canterbury. She looked slightly shocked because she knew this address intimately. But Mary seemed genuinely happy that I was now living in the house and had rescued it from disrepair. After marrying her brother Arthur’s good friend, and fellow artist, John Perceval, Mary and John had lived at 38 Wentworth Avenue for 20years. Perceval was best known for his brilliant Williamstown series which was also co-incidentally, the first major exhibition at Australian Galleries shortly after it opened in 1956. Mary had left Perceval to marry Nolan after John’s descent into alcoholism and the death of Sidney’s wife Cynthia. The original Heide farmhouse in Bulleen where Sidney Nolan painted his original Ned Kelly series of paintings. The young artists Boyd, Perceval and Nolan were also all members of the avant-garde 1940s literary and artistic movement: The Angry Penguins. So Mary had carried three of the greatest surnames in modern Australian art. Who would have guessed that my photograph of Nolan with the mask would have hit the mark so squarely. It has now been reproduced many times in magazines and press, most recently in Bonhams’ Summer 2017 Catalogue, where it accompanied an article written by the noted art writer/critic John McDonald for Nolan’s centennial. 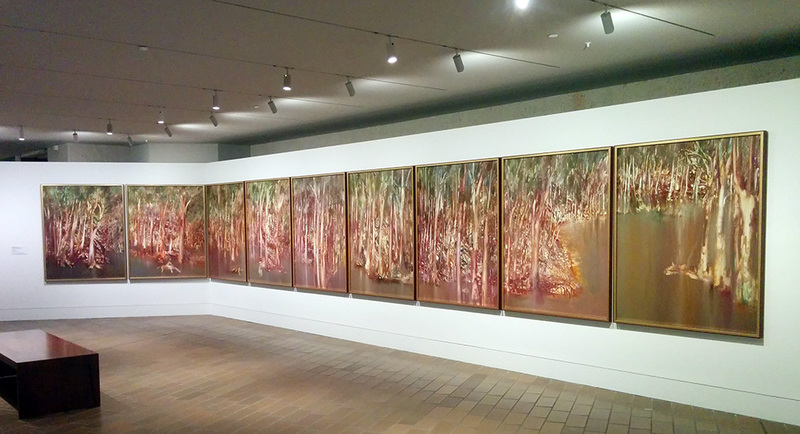 The photograph was on display at the National Gallery of Australia in Canberra, as part of a long-term hang of Nolan’s 9-panel Riverbend masterpiece, while a purpose-built gallery was designed for it, at its ANU home. 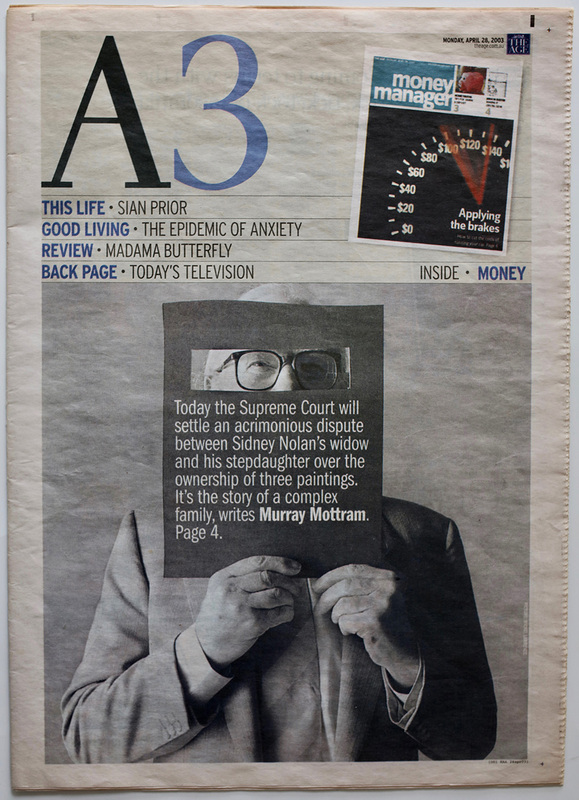 The Age newspaper used the photograph as its April 28, 2003 front-page illustration of a story about the bitter Supreme Court battle between Lady Mary and Jinx (Nolan’s step-daughter from his marriage to Cynthia) over the ownership of three paintings, following Sidney’s death. 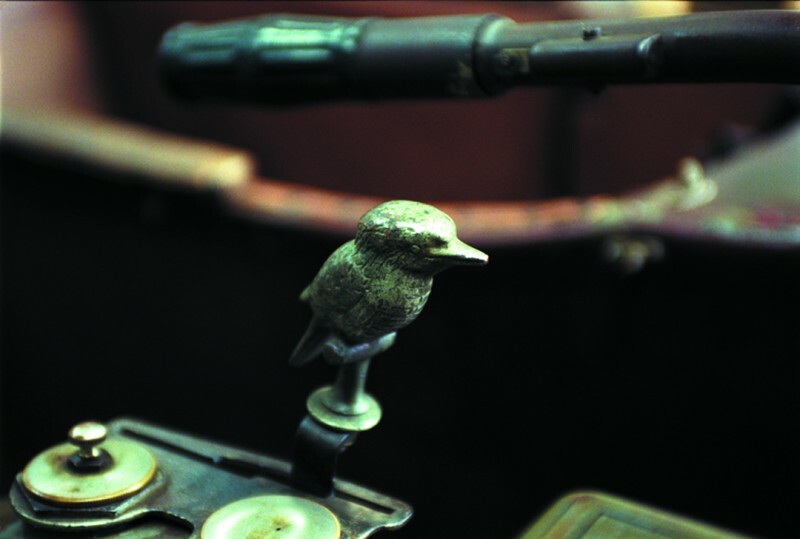 The photograph is also in the permanent collection at The Heide Museum of Modern Art. 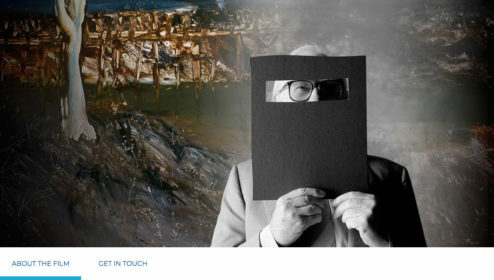 Stuart Purves called me to say he was planning an exhibition of John Kelly’s work at Australian Galleries in Melbourne. Stuart had a long relationship with the Nolans and recently started to represent John Kelly – no relation to Ned Kelly! John Kelly had been very respectful to Nolan and influenced by his work over a long period of time, notably Nolan’s Moon Boy series painted in 1939 on the eve of the Second World War. John Kelly was born in Bristol, England, and like Nolan, also chose to live in Europe. 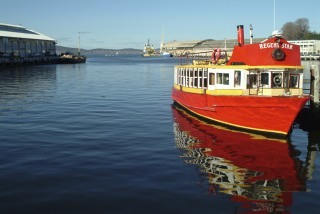 Nolan (although with Irish origins) lived in Wales at his property, The Rodd, while Kelly has chosen to live across the Irish Sea in southern Ireland. Stuart asked me to photograph John Kelly with a view to matching the photographs taken 30 years earlier as part of an upcoming exhibition of Kelly’s work, along with a selection of Nolan’s original Moon Boy works-on-paper from the 1950s from the collection of Lady Nolan. I decided to bookend the portraits of Nolan and Kelly to ensure the intertwining of the remarkable connections as an intrinsic part of the proposed exhibition. 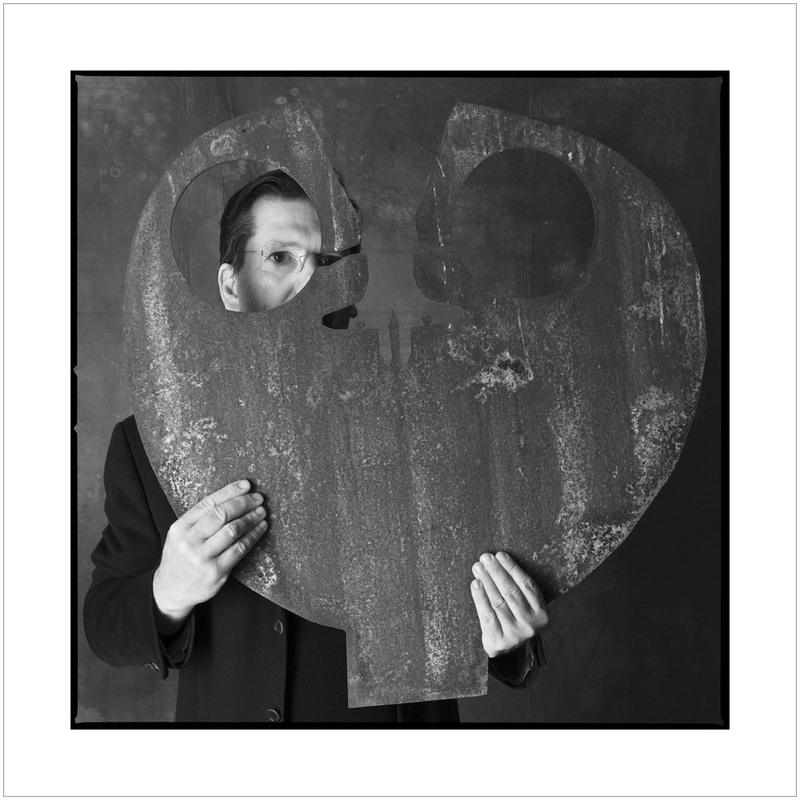 First, I called Rob Imhoff to find out what had happened to the painted canvas backdrop which I had used as a background to photograph Nolan at Rob’s studio 30 years before: “Yes, of course I still have it!” exclaimed Imhoff. He not only had the backdrop, he had also kept the original studio lighting I had used in 1987. It almost seemed too good to be true. It meant that I could technically replicate, as closely as possible, the original idea for Nolan’s Ned Kelly mask with John Kelly. We were going to shoot in Rob’s studio in South Yarra, with Rob (one of Australia’s best photographers) as my assistant! John Kelly arrived from Ireland and three days later we were in the studio. Rob and I had arranged the studio and the lighting, re-hanging the backdrop to ensure the markings were as close as we could get to where they had been for the Nolan shoot. Kelly came wearing a dark suit with a black polo and with his large rusted steel sculpture inspired by Nolan’s original Moon Boy image. The photo shoot was every bit as smooth and as painless as with Nolan all those years before. But this time we were working with all the advantages of digital which allows you to see exactly what you’re doing on the fly. 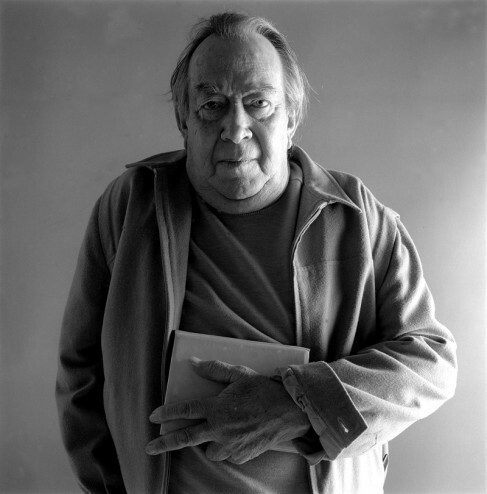 Michel Lawrence portrait of John Kelly holding his Sid Nolan inspired sculpture Nolan Light. There we have it. Thirty years between sessions and a close approximation of two photographs born of the same idea, with the same environment, the same technical equipment (albeit with very different cameras) and with the same eyes melding it together. An epic adventure in its own right! And importantly, here is living proof that in this far-flung and extraordinarily complex world, everything still seems connected: More closely than we could ever imagine. With special thanks to Sir Sidney Nolan, Lady Mary Nolan, Stuart Purves, David Lancashire, Robert Imhoff, Greg Elms (Photographic Assistant for the Nolan shoot), John Kelly, and Bryan Gracey, Roger Stewart and Darren Rokahr (CPL Digital – printing and mounting). Photographs framed by Greg von Menge. John Kelly: Sunshine and Moonlight. Accompanied by a selection of works on paper from 1962 of Moon Boy by Sidney Nolan and photographs of Sidney Nolan and John Kelly by Michel Lawrence. 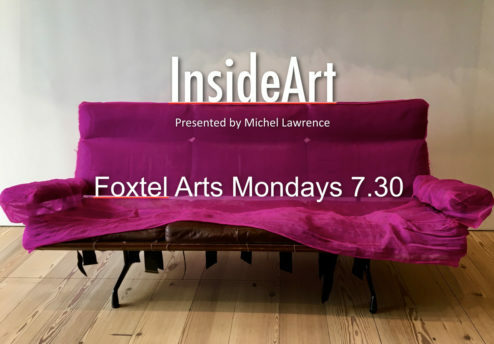 InsideArt, the Australian arts program, premieres on Foxtel from September 4. 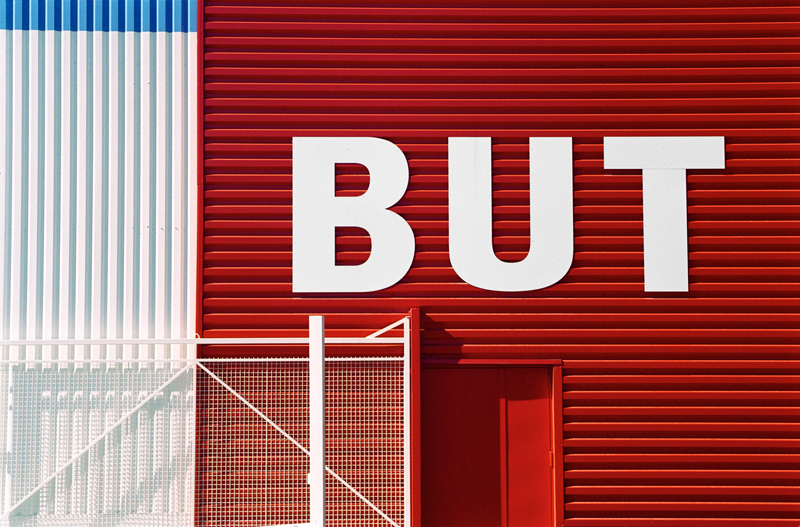 InsideArt has had unprecedented access to many leading artists, sculptors, printmakers and photographers, gallerists and directors here in Australia and overseas. InsideArt has been in production since 2012 launching originally on Channel 31 Melbourne, Sydney and Perth and was voted Best Arts Program on Australian Community TV in 2014. 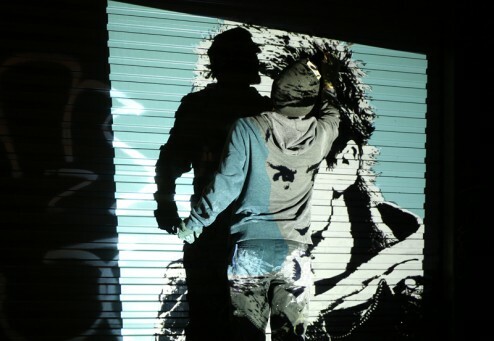 “InsideArt has always concentrated on artists with something to say and with artwork of the highest calibre,” Michel said. The program moves to Foxtel from September: “I’m really excited to have such a good slot and hopefully a great chance for the program.” Says Michel. 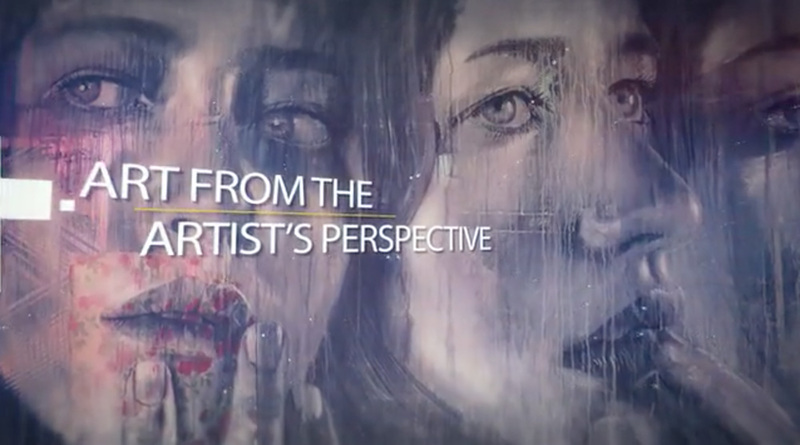 The Foxtel series of InsideArt will launch with an in depth look at portraiture. The episode titled The Human World will feature four of Australia’s best portrait artists, including two-times Archibald prize winner Del Kathryn Barton, Lewis Miller and 2016 winner Louise Hearman. The program also includes Vincent Fantauzzo who has won the Doug Moran National Portrait Prize, the Archibald Packing Room Prize, and the Archibald People’s Choice Award four times. 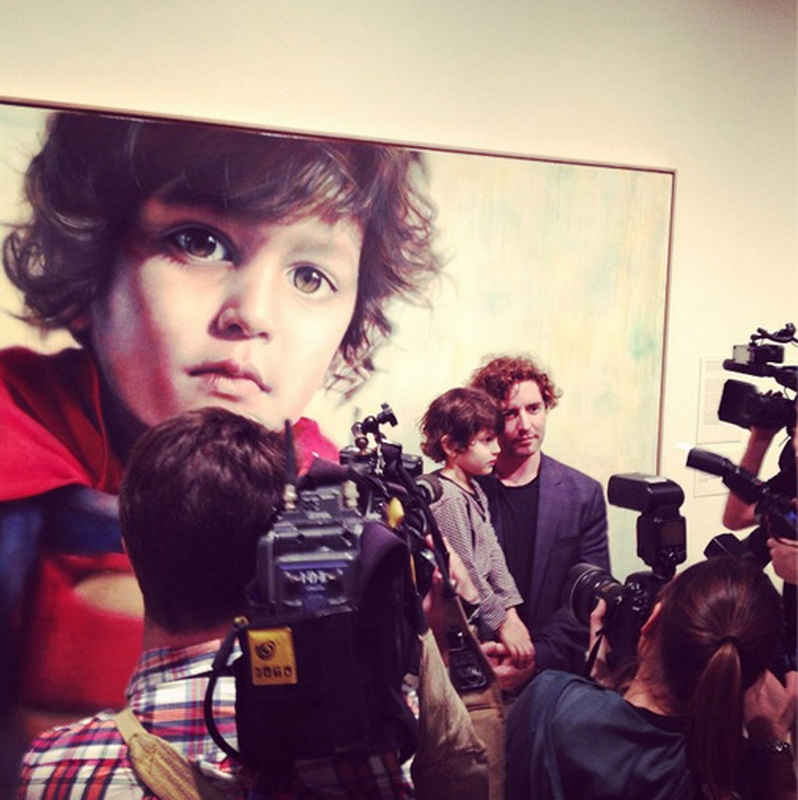 Vincent Fantauzzo wins another People’s Choice awards at the Archibald Prize with a portrait of his son Luca. “But it doesn’t look like me” Stein is reported to have said to Picasso. “Don’t worry. 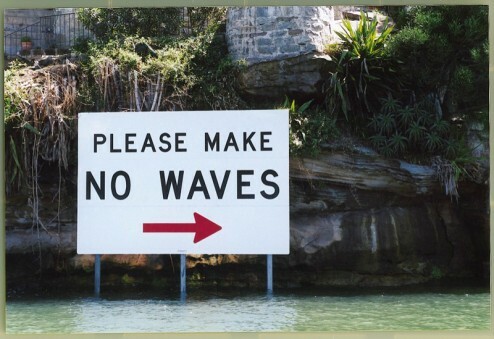 It will!” replied Picasso. 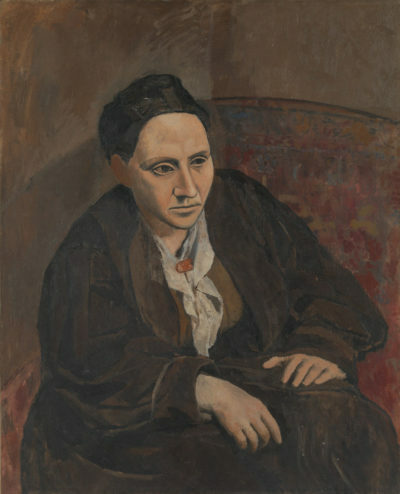 Picasso’s portrait of Stein was dark and brooding and is seen as a precursor to his Cubist period. It was a powerful portrait even if it was not a traditionally soft and romantic likeness. But that’s what makes for a great portrait. The legend of Athol Shmith lives on! 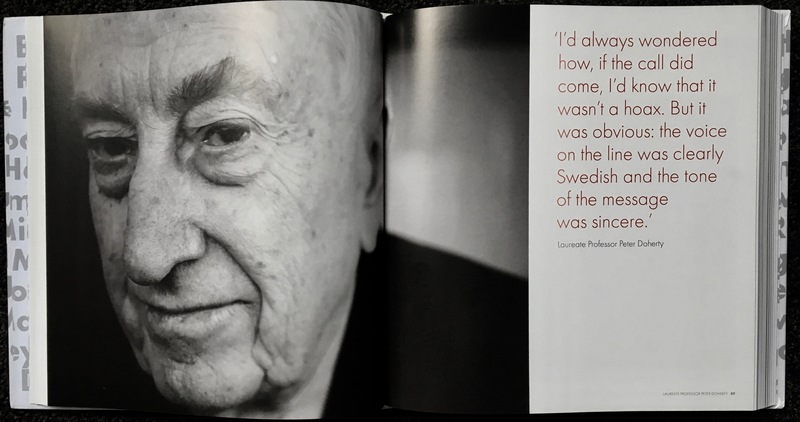 The winter edition of The National Portrait Gallery’s quarterly magazine Portrait, has a feature on the great Athol Shmith who was both a very fine fashion photographer as well as a great educator. My portrait of Athol taken in March 1985 accompanies the six-page article in Portrait57 by Aimee Board. It’s an excellent piece – you can read it here – or buy the magazine. 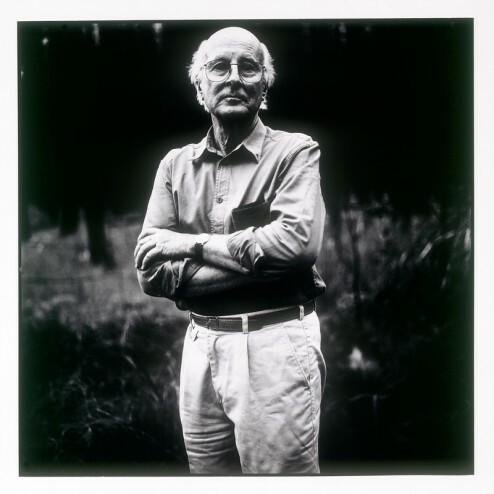 Portrait of Athol Smith by Michel Lawrence. Collection of the National Portrait Gallery. I can’t remember now why I took the photograph, other than I think Bryan Gracey suggested I should! Gracey was on the staff of the Prahran College in the Photography School where Athol was Head of Department for around 10 years with other Australian photography giants Paul Cox and John Cato. 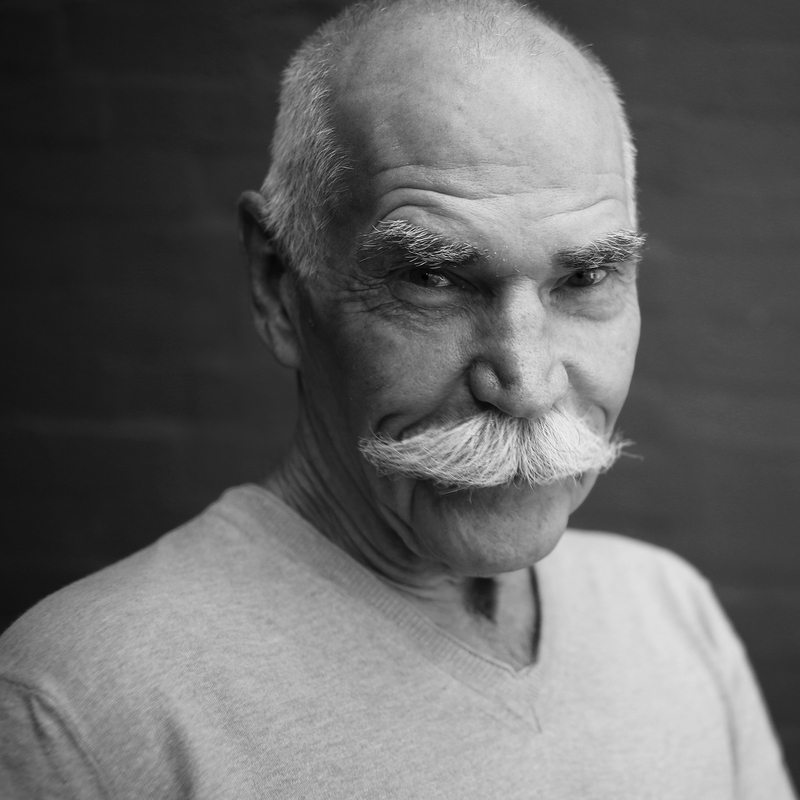 It was an extraordinary period at the Art School and Athol brought decades-long experience of his life as Australia’s premier fashion photographer to a whole new generation of students. Athol was part of Melbourne’s royalty for a long time so I just presumed his somewhat English reserved demeanour was how he was. He was our version of Norman Parkinson. Perhaps, his haughtiness was really just masking an innate shyness. He was recognised in London as well as Melbourne. He was elected a Fellow of the Royal Society of Arts and was also a member of the Royal Photographic Society in the days when a trip to London meant three months on a ship! 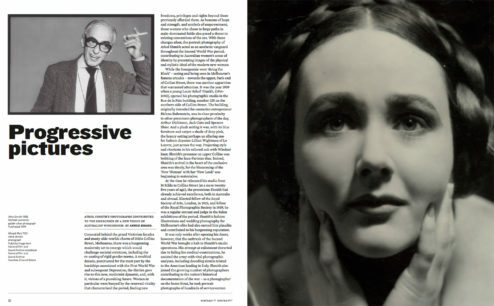 Aimee Board’s article covers his portraiture as well as his fashion which Aimee says contributed to the emergence of a new vision of Australian womanhood. 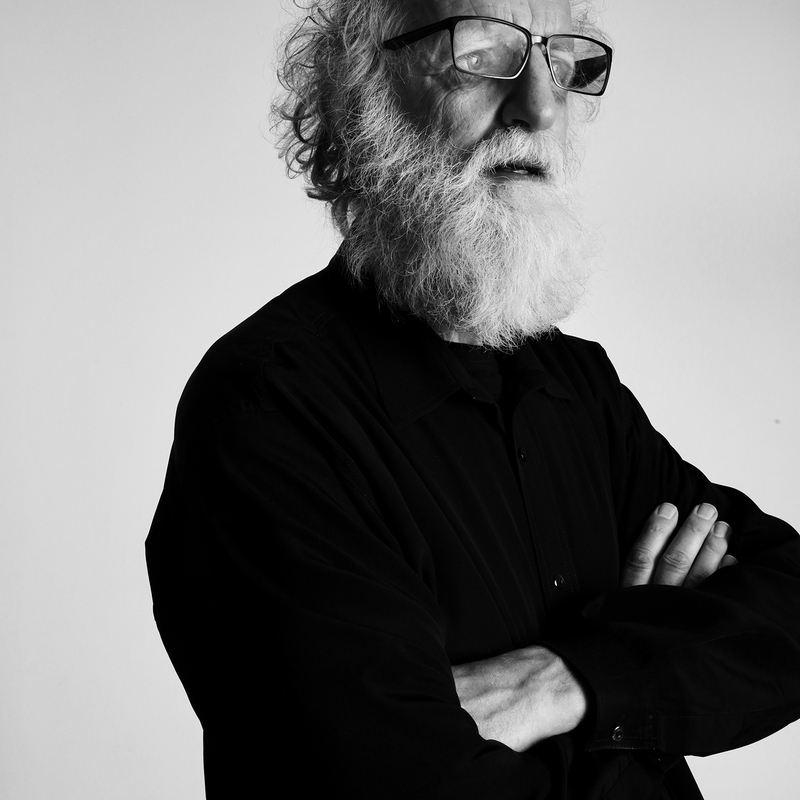 Rod McNicol , the acclaimed portrait photographer was photographed by Michel Lawrence at McNicol’s small portrait studio in Fitzroy. 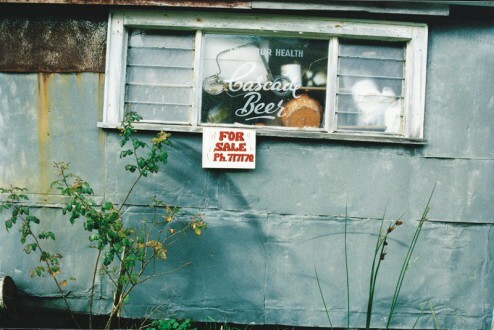 Rob Imhoff, like Athol was a highly successful commercial photographer, but perhaps with more breadth to his practice. Rob was a fashion photographer too, but he also shot cars and packaged goods as well: “Athol became one of my early mentors and one thing he taught me was that you didn’t need a motor-drive camera – which was very trendy at the time: “Don’t press the button and HOPE you get the shot,” he’d say. “Athol was adamant that you should be able to direct the performance and click the shutter at the appropriate time” says Rob. 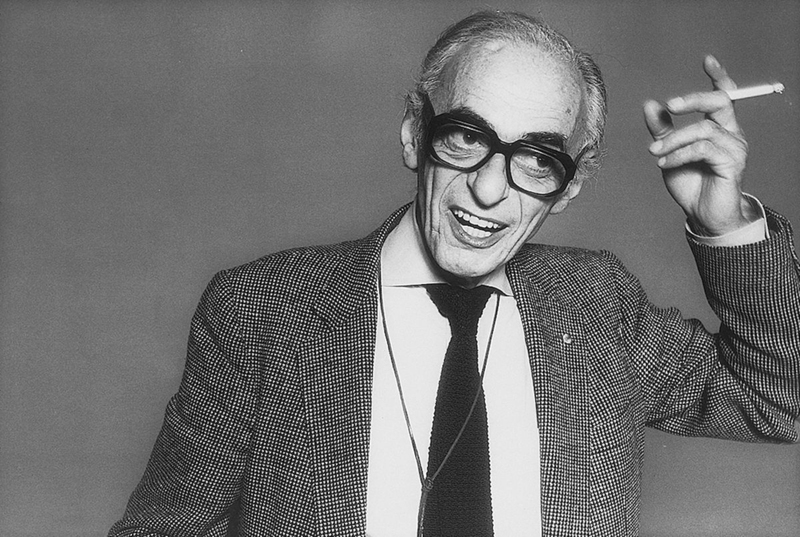 “I called him ‘The Conductor’ because he had that Hollywood-era power of the conductor directing everything. 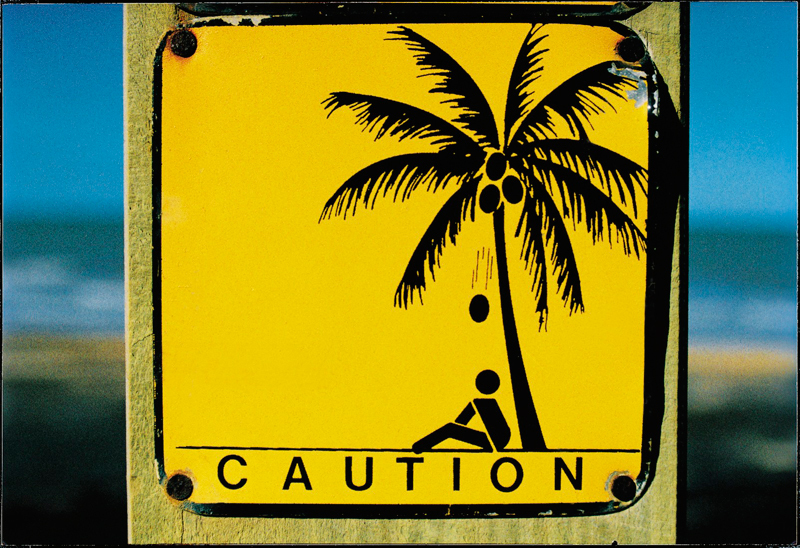 He knew what he wanted – and importantly- what he didn’t want!” said Rob. Athol was a great photographer and an intriguing character. 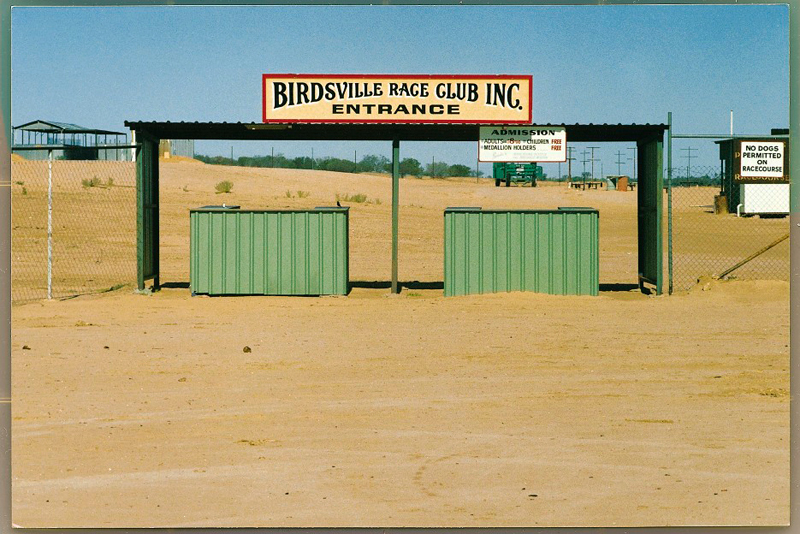 He deserves to be remembered as one of Australia’s pioneering master photographers. Smashing the glass ceiling – 21 women who have done it! Michel Lawrence has added an epic 21 woman group portrait to his folio of important portraits. The Law Institute of Victoria commissioned Michel to undertake the large group portrait for the August 2017 edition of the Law Institute Journal featuring 21 women in a number of the most influential positions in Australian law. Included in the portrait were the Chief Justices of the High Court of Australia, Susan Kiefel; The Victorian Supreme Court, Marilyn Warren; The Family Court of Australia, Diana Bryant; and the Victorian Governor, Linda Dessau. The commission was a major exercise in logistics, managing the extraordinary timetables of Chief Justices, CEO’s, Law School deans, the most senior solicitors and barristers and organisation heads. The 21 were photographed in groups and then put together in post-production to achieve a seamless single portrait of the 21 women: “It was a major production with hair and makeup, a stylist, technical assistants – it was more like a film shoot than a single stills shoot'” said Michel. 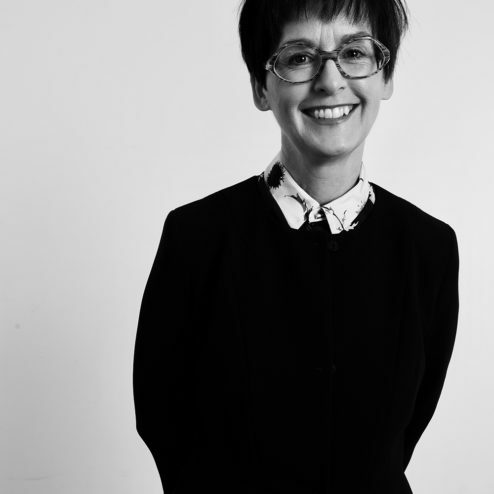 The President of the Law Council of Australia – Fiona McLeod SC – got into the swing of the mega shoot for Australia’s leading women lawyers and legal administrators. 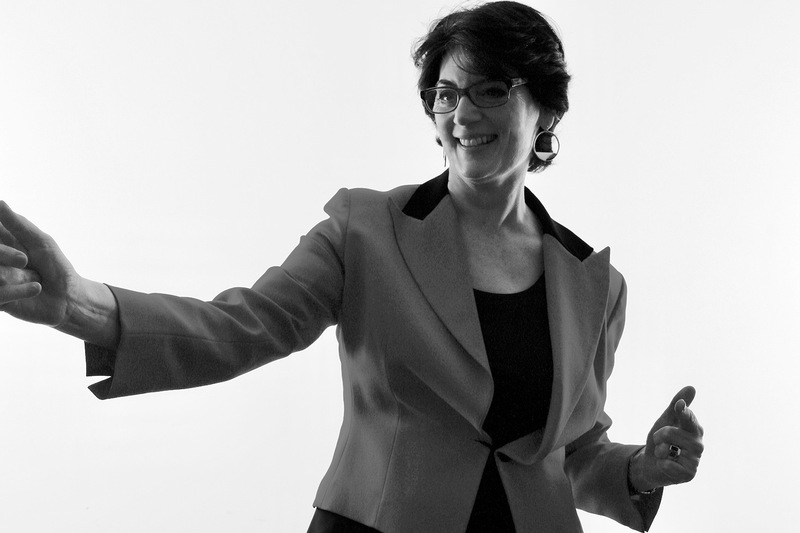 Photograph by Michel Lawrence for the Law Institute. The Managing Editor of the Law Institute Journal Carolyn Ford managed the project for the Law Institute and Bryan Gracey, prinicpal of CPL Digital managed all technical aspects of the shoot and oversaw the extensive digital manipulation during the post production phase with a team of three specialist retouchers. “Everyone who was invited to participate agreed and everyone seemed to really enjoy the experience. It was very much a fun event and perhaps not quite what you might expect of the most senior judges in Australia as well as Victoria’s Governor Linda Dessau – a former judge herself.” said Michel. 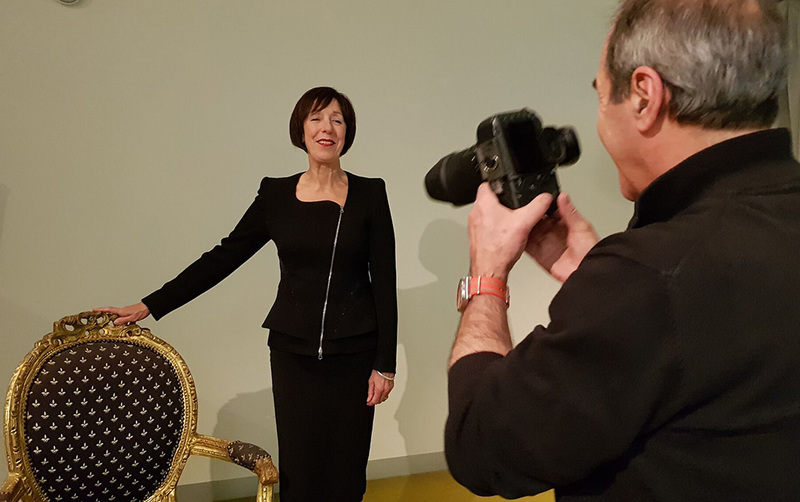 Photographer Michel Lawrence prepares to photograph Marilyn Warren, the Chief Justice of the Supreme Court of Victoria for her individual portrait which is featured in a 20 page section of the Law Institute Journal. 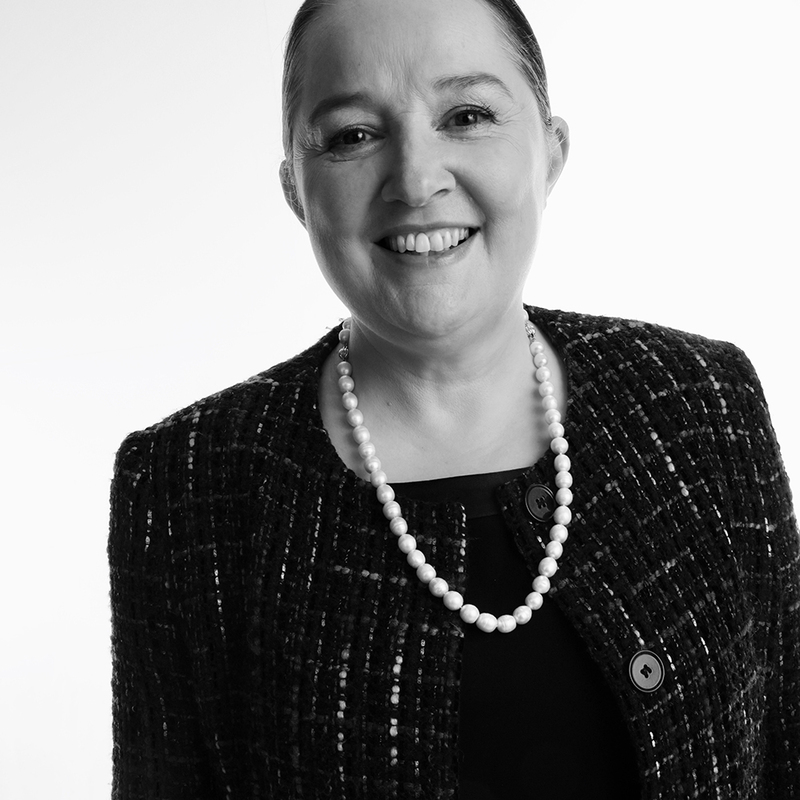 “Now Susan Kiefel has been appointed the first woman Chief Justice of the High Court , while both Diana Bryant and Marilyn Warren are nearing retirement. 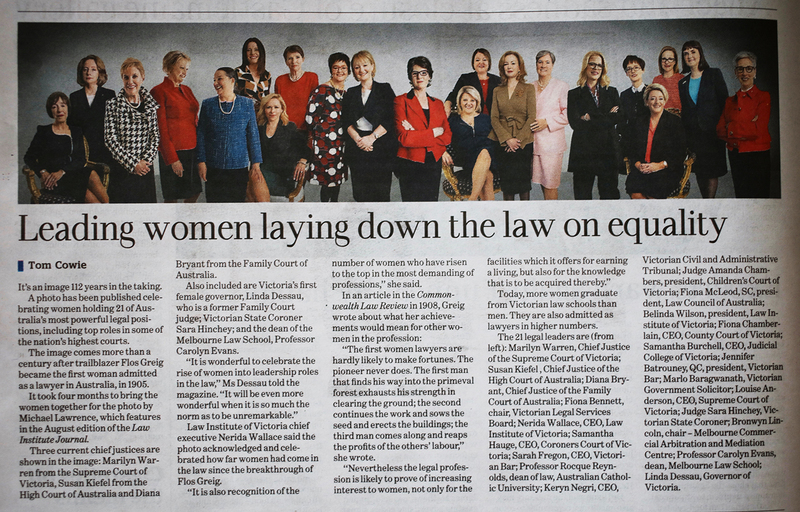 In 2017 women hold many of the most senior positions in law in Australia and women graduate in higher numbers from Victorian law schools than men.” said Nerida. Nerida said she was delighted with the end result: “Michel did a fabulous job” she said. The commission also included 21 individual portraits of the participants in the historic shoot. Above, Nerida Wallace, CEO of the LIV. 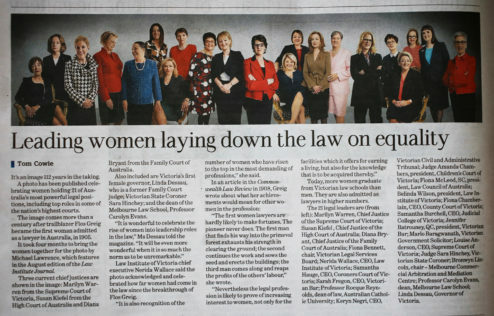 Below Louise Anderson, CEO of the Victorian Supreme Court (top) and Marlo Baragwanath, the first woman appointed the Victorian Government Solicitor. National Living Treasures project takes shape. 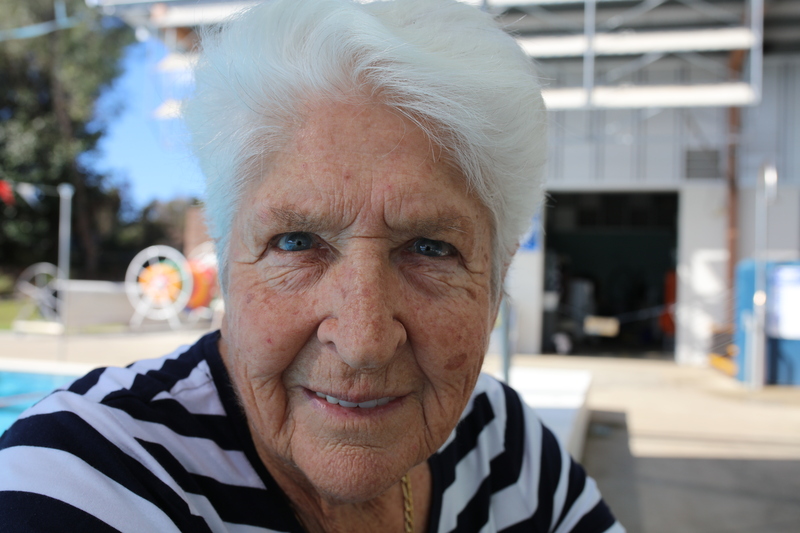 The National Living Treasures project is a celebration of Australians who contributed significantly to the development of Australia – and who have made a difference. 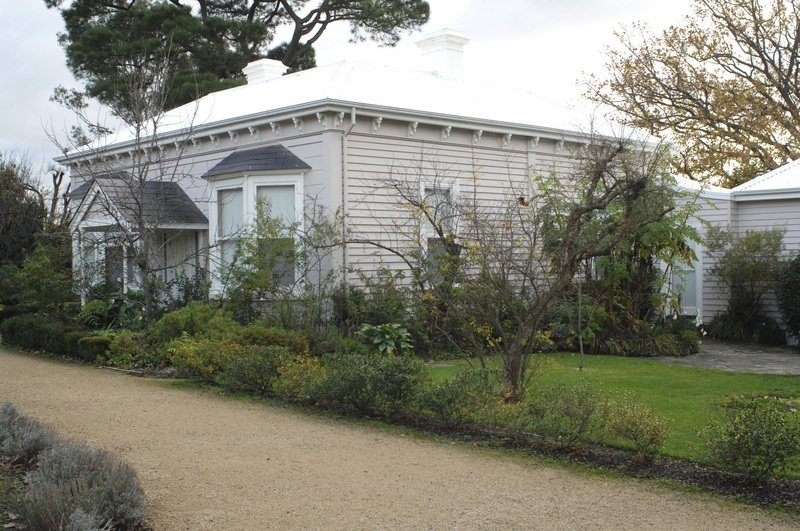 Melinda Williams came across the National Trust’s National Living Treasures while she was working as a producer for Neil Mitchell’s radio program. 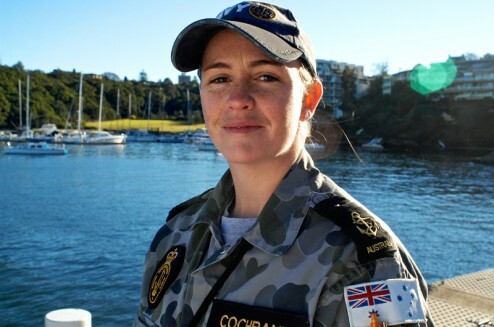 Deciding that she wanted to record this remarkable group of Australians, she contacted Michel Lawrence to see if he was interested in partnering her on the project. Melinda had seen Michel’s ‘Framed’ portraits of Australian artists some years before and was keen for him to undertake the creative. Michel agreed and the team was set to go. 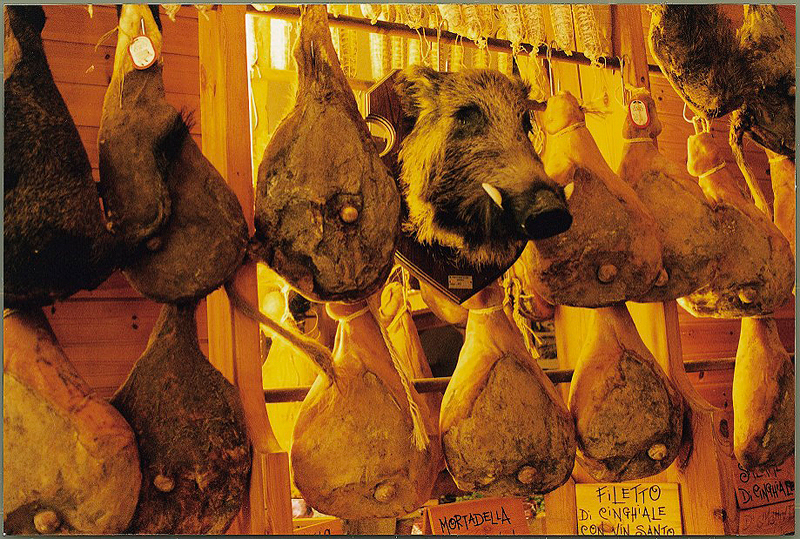 In 1997 the National Trust conducted a public vote and 100 National Living Treasures were elected. The list includes doctors, scientists and researchers, politicians, lawyers and jurists, actors, performers and musicians and a Nobel Prize winner! It is a remarkable group of people. Many have also been named Australian of The Year and many more have Australian honours as well. With 45 portraits and interviews already completed Michel and Melinda are well underway. 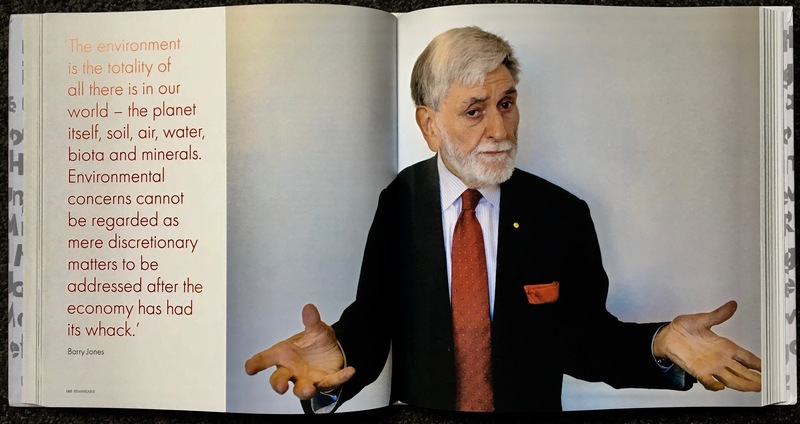 The first six months have seen Michel photograph and film people of the stature of Barry Jones, Rod Laver, Herb Elliott, Sir William Deane, Dame Marie Bashir, Professor Fiona Stanley and Professor Peter Doherty (Nobel Prize in Medicine), Sir Gus Nossal, Graeme Murphy, and Janet Holmes a Court to name just a select few. Portrait of Peter Garrett by Michel Lawrence. 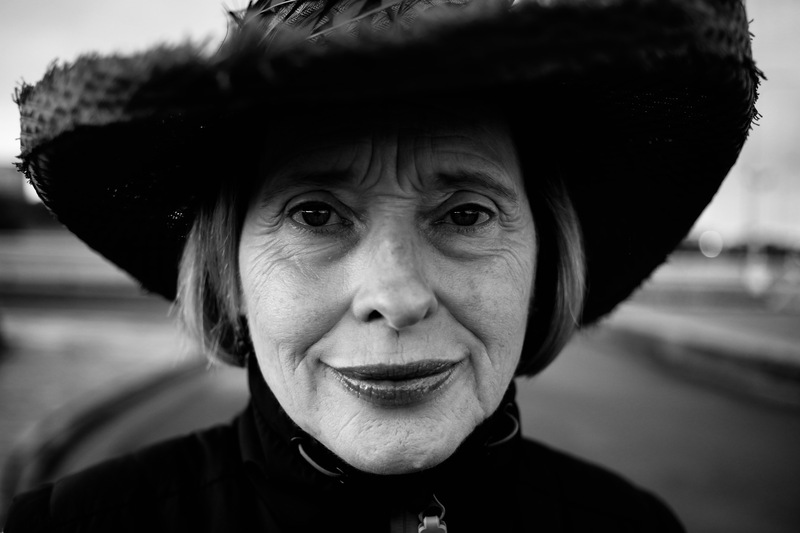 Each Treasure will be featured in a portrait photograph by Michel Lawrence as well as a video interview. Melinda Williams is writing biographies on all Treasures. Scribe Publications will publish the resulting book with plans for a release in late 2017. Exhibition and broadcast arrangements are currently under discussion. 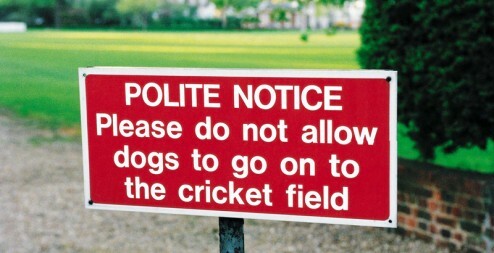 The National Trust is also planning an update to the list to coincide with the launch. PS. That’s Gai Waterhouse at the beginning of the video. Photographed and filmed at Randwick Racecourse at dawn. Michel Lawrence’s portrait of Sid Nolan holding a cut-out Kelly Mask is now on display at the National Gallery of Australia in Canberra. 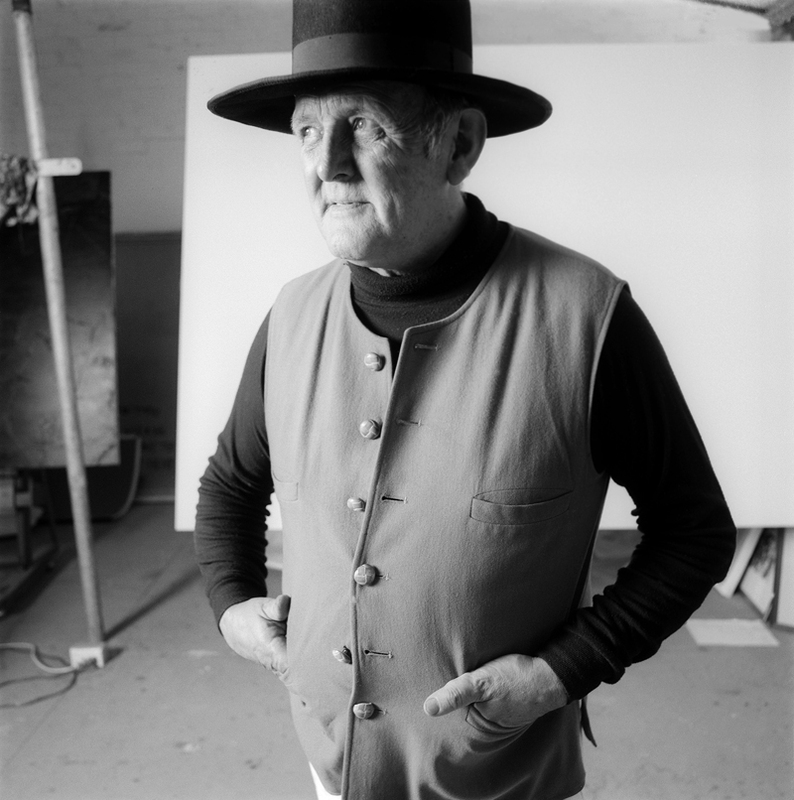 Michel took the Sid Nolan portrait in 1987 at Rob Imhoff’s wonderful Lighthouse Studio in Prahran, for the book Framed. 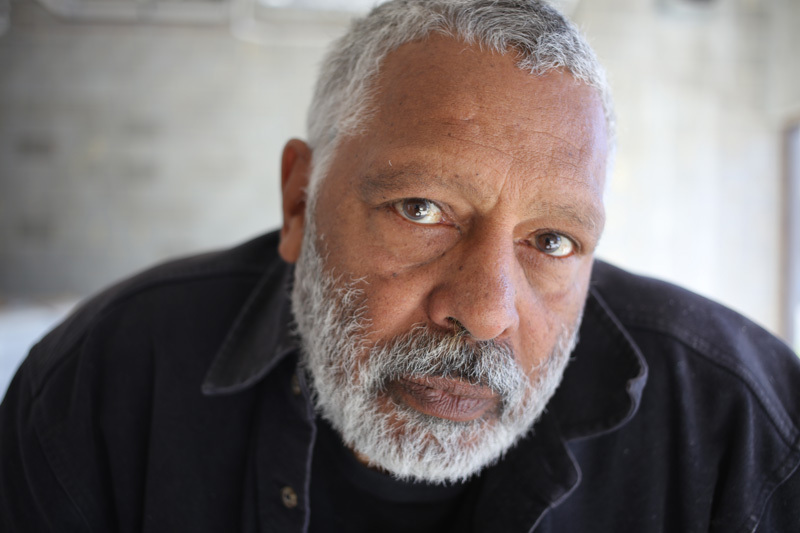 Michel Lawrence’s Sid Nolan portrait as Ned Kelly is just one of 100 of Australia’s most prominent painters, sculptors and print-makers photographed over a ten-year period from the mid-1980s until the mid-1990s. Sid Nolan was most famous for his Ned Kelly series which is also at the NGA and Lawrence had always thought that was a good match! The reproduction of the Nolan photo is displayed with a new exhibition of the Riverbend series, featuring nine very large pieces on loan from the ANU. 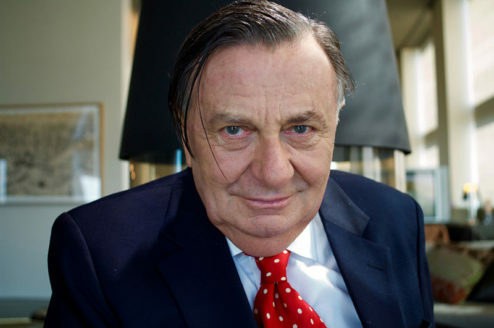 Michel recalled the session: “It was important to me for a number of reasons: Sid was married to Mary Boyd (Arthur’s sister) who had formerly been married to John Perceval. And at the time I was living in the old Perceval home in Canterbury! Now that’s 2 degrees of Separation. Anyway Sid looked incredibly staid and conservative in his banker’s suit until I pulled out the prop, a cut-out Kelly mask. His eyes lit up and away we went,” said Lawrence. The Riverbend series was painted in England in 1965 and is an intensely personal depiction of the bush painted from memory over a couple of days. 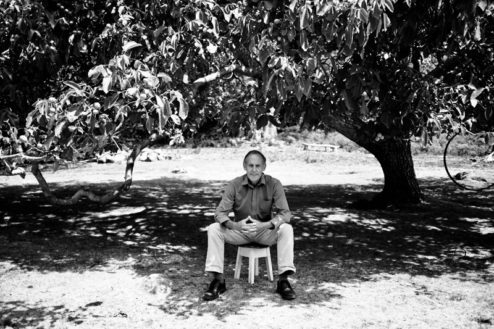 Nolan had spent his childhood holidays on the Goulburn River near Shepparton, and he described it as “my father’s country”. 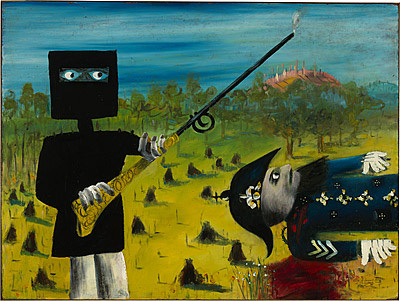 Ned Kelly, Nolan’s iconic bushranger is visible in a number of the paintings playing hide and seek with the police. The Riverbend series hangs in the gallery opposite the space where the Kelly Gang series is displayed! The Kelly series was painted at Heide while Nolan was living with John and Sunday Reed and the gift of the paintings by Sunday Reed to the NGA laid to rest a dispute over Nolan’s claims to works he had left behind at Heide. He subsequently painted more Kellys but none achieved the acclaim of the originals. Besides the Sid Nolan portrait, many of the Framed photographs are in numerous private and public collections including the National Portrait Gallery in Canberra, The National Library, The Museum of Modern Art at Heide, The Queensland Art Gallery, Melbourne University and numerous regional galleries and a number of private collections. Michel Lawrence’s book of photographic portraits of Australia’s leading 20th Century artists, ‘Framed’, is enjoying a strong resale market on Amazon. 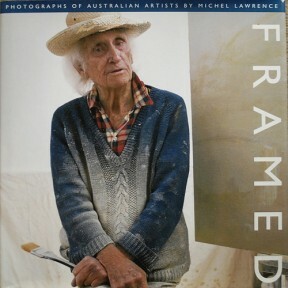 The book – ‘Framed: Photographs of Australian artists by Michel Lawrence’ – was published by Hardie Grant in 1998 and has been out of print for many years. Above: Michel Lawrence’s iconic portrait of Lloyd Rees which graces the cover of ‘Framed: Photographs of Australian Artists’ was also a cover of Good Weekend magazine and was included in the magazine’s Top Covers for its 30th Anniversary issue. 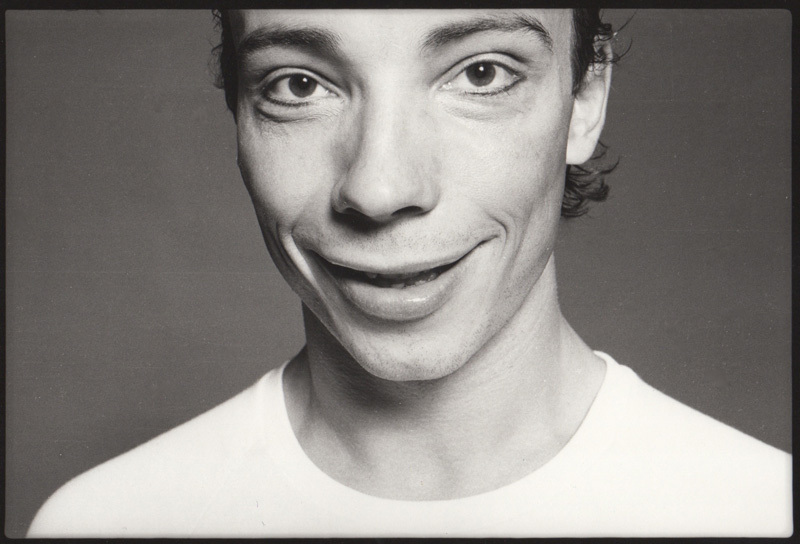 The photo is also in the collection of the National Portrait Gallery. Despite the fact that there have been several subsequent books by other photographers documenting the period, Framed has continued to command high prices on the second hand market. ‘Framed’ prices at more than A$400 a copy! Prices have been as high as GBP £199 (about A$415) and regularly sit around the A$100-A$200 (see Amazon grab below) for good, used copies. Not bad for a book which sold, when new, for less than $50! A screen grab of a recent entry from Amazon advertising used copies of ‘Framed’. Framed was the product of 10 years work, photographing the great artists of the Australian Post-War period, including Sir Sidney Nolan, Arthur Boyd, Lloyd Rees, Donald Friend, Clifton Pugh, Charles Blackman, Robert Klippel, Margaret Olley and John Olsen, just to name a few of the 100 artists represented. Portrait of John Olsen from the book Framed. Portraits of Australian artists by Michel Lawrence. Michel Lawrence took the portraits of more than 100 pf Australia’s greatest artists from the period and they were first publicly exhibition at Stuart Purves’ Australian Galleries in Melbourne and Sydney. 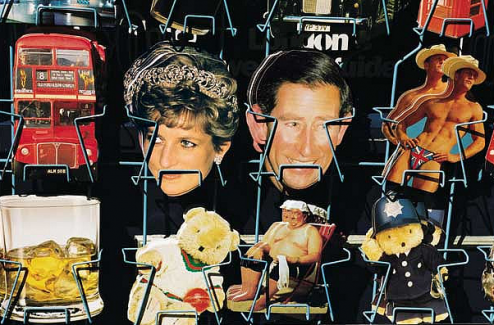 The portraits formed a sell-out exhibition and many went to large corporate collectors. For instance, The Museum of Modern Art at Heide acquired more than 30 prints while the regional Castlelmaine Gallery acquired more than 20. A number of private collectors also bought groups of 4 and 6 of the portraits. 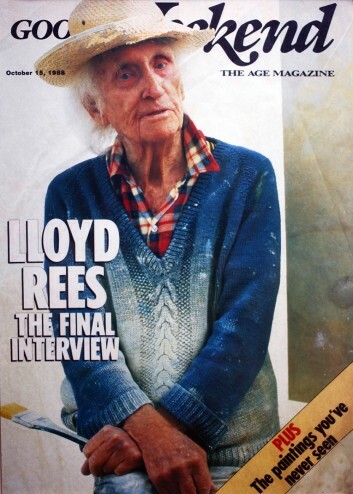 The photo of Llloyd Rees has been reproduced several more times in Good Weekend since the first issue and was named by the magazine as one of its 30 Best Covers. The Rees Photograph is also in the collections of the National Portrait Gallery, QAGOMA (Queensland Art Gallery) and several other major institutions. So why is Framed commanding these high prices? And especially in the UK and US markets where most of the books seem to be sourced? Good question. Perhaps there is a growing interest in Australia’s golden post-war art period. Perhaps, Framed just captured a time of artistic flowering that has also captured the imagination. But whatever it is, we are grateful that it’s attracting this kind of attention and not sitting on remainder tables! 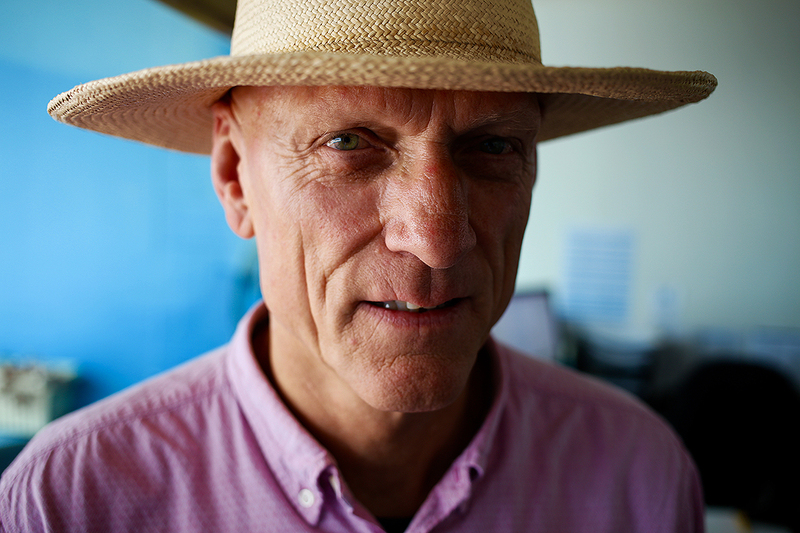 Michael Johnson, the contemporary abstractionist, looking distinctly other worldly, in his backlit Sydney studio. Portrait by Michel Lawrence from the book Framed. John Pinder had a genius of talent spotting. He just knew when someone had IT! And there were lots of them with talent but nowhere to show off that talent. Until 1973 when he founded the Flying Trapeze in Brunswick St Melbourne, in what was then a less than salubrious part of Melbourne. But the FlyTrap, as it was affectionately known, was tiny with the stage the size of a pocket hankerchief. 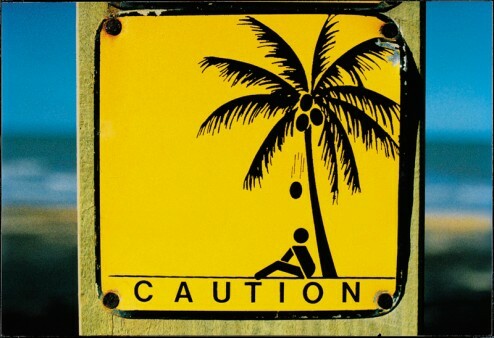 But it allowed John to show off his own talents for promoting unknown talent to an unsuspecting public. 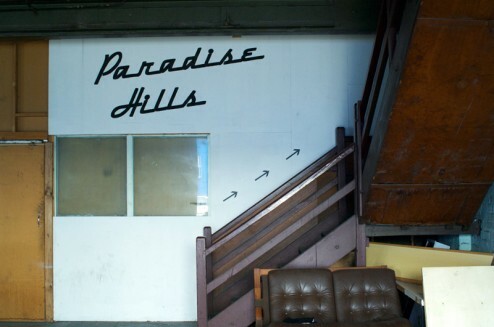 Five years later he opened the Last Laugh in Smith St, one street down from Brunswick St and even less salubrious. 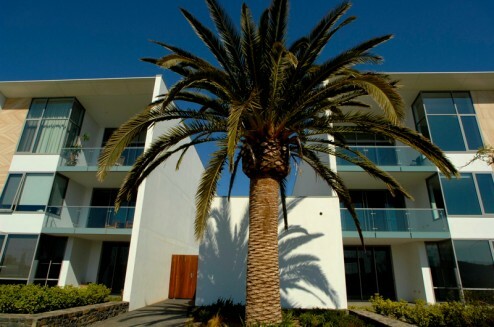 An old dole office – and before that a bank – provided just what he needed. 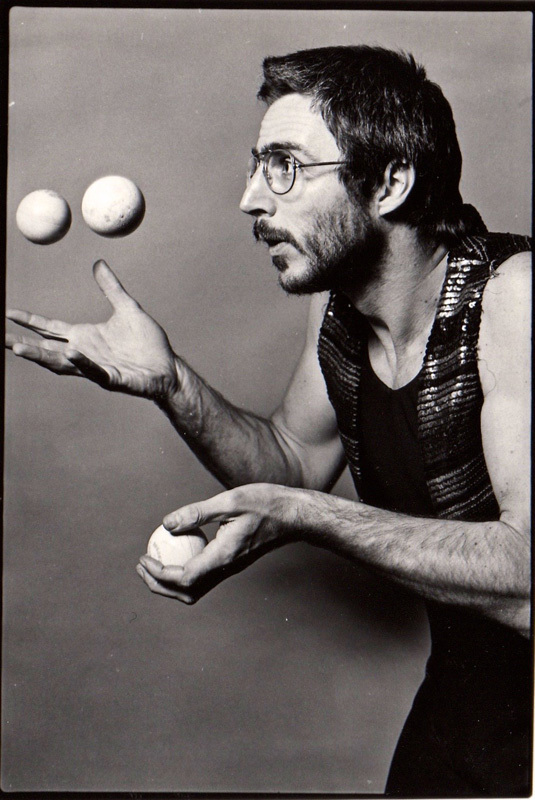 Jon Hawkes, who co-founded Circus Oz with John Pinder, struts his stuff. 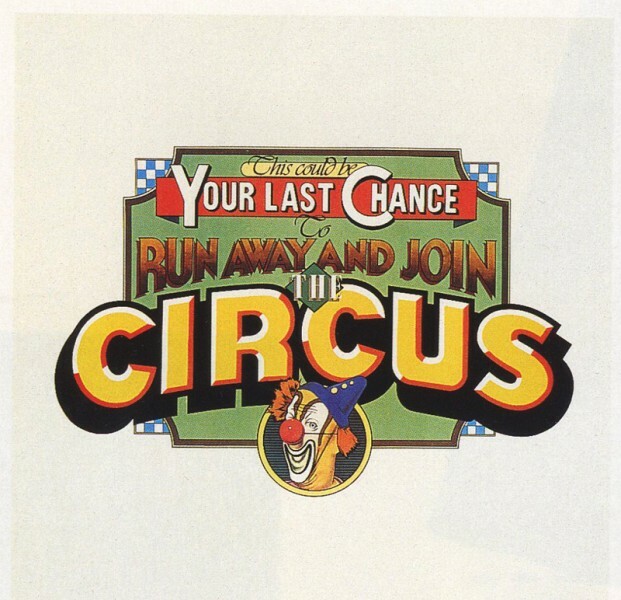 I had just returned from London in 1978 when I was introduced to John and his great mate Jon Hawkes as they were launching Circus Oz. 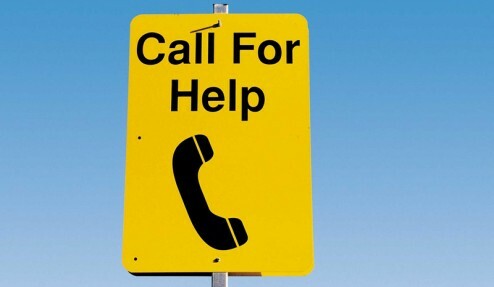 They needed someone to handle their advertising, their posters, their promotion and their talent photos. 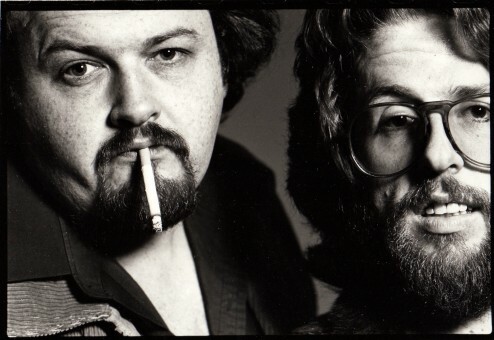 With my partner Bill Burrows we were just in the right place at the right time as John realized his dreams of turning a sleazy old dole office into a magical venue for a crazy bunch of performers, musicians, artists and waiters. 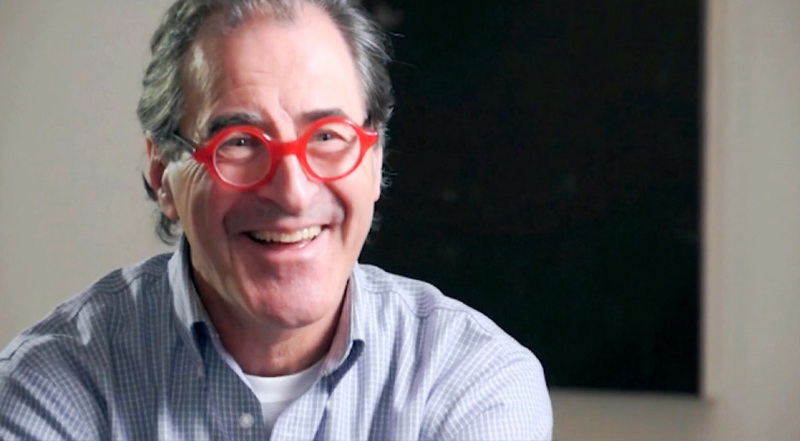 Bill and I spent five years helping John mould his ideas into ads, posters and all the other tools of the traditional communications industry into something he could sell to the Mums and Dads of the suburbs. 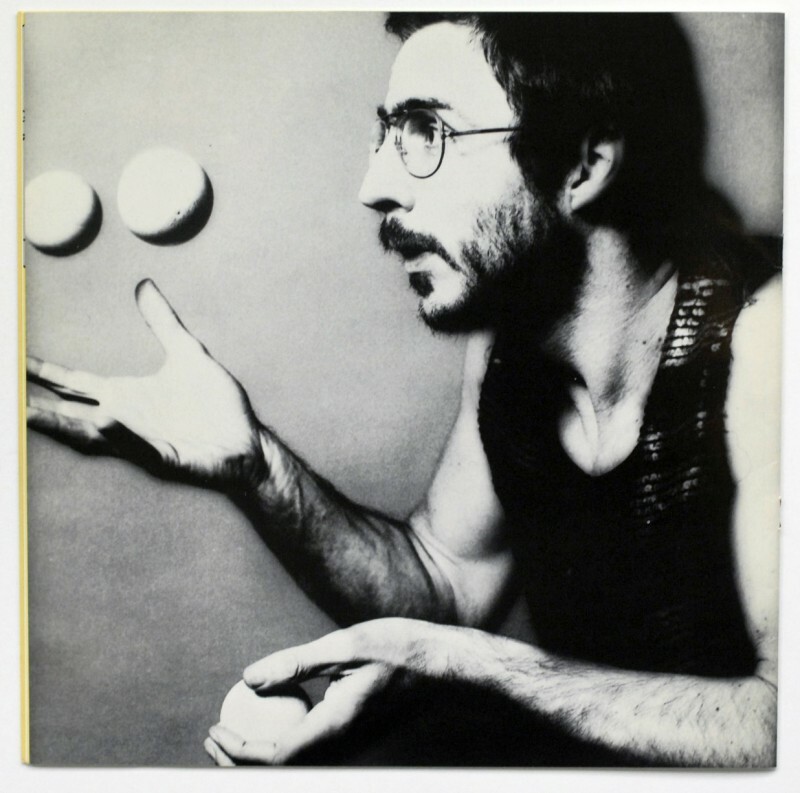 Because, whilst John was tapping the extremes of quirky, bohemian, and often bizarre comedy, he was selling it to to Australian audiences everywhere with a hunger for something a little different – or maybe a whole lot different! John was a big man whose brain was never turned off. He always had a new scheme and a new way of presenting the unpresentable. 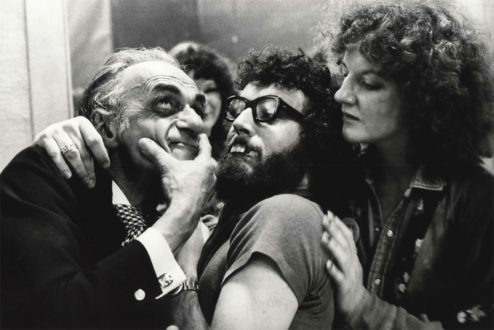 His roll-call of talent was as diverse and as crazy as he was: Los Trios RingBarkus, The Whittle Family, Hokum W. Jeebs, and a raft of now well-known names like Richard Stubbs, Wendy Harmer, Jane Clifton, Mary-Anne Fahey, Ian McFadyen, Peter Moon and Jane Turner to name a few! What a time it was! 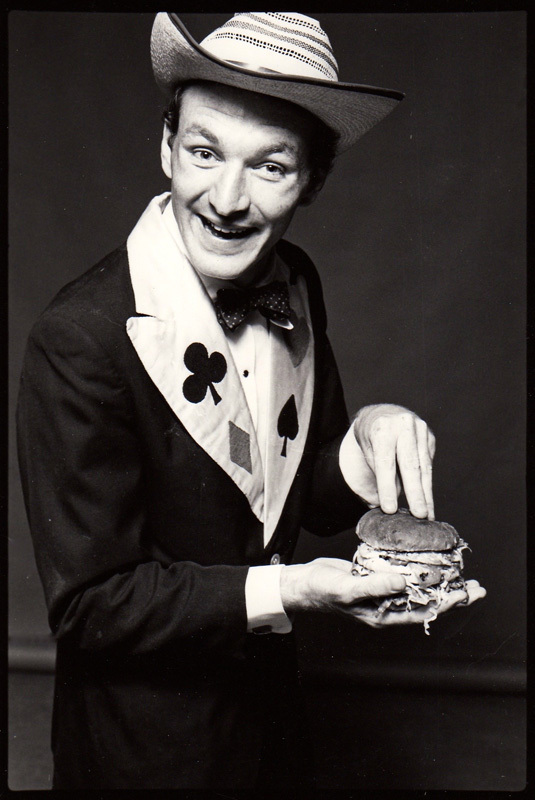 And part of the magic was John’s other genius for employing the craziest funniest waiters ever seen, anywhere. The waiters at the Last Laugh had a talent all of their own. Brian Nankervis ( Rockwiz co-presenter) is third from right. John died in Sydney from cancer on May 27, aged 70. What a loss. Mick Conway was already well-known when he starred in his own show at the Laugh. 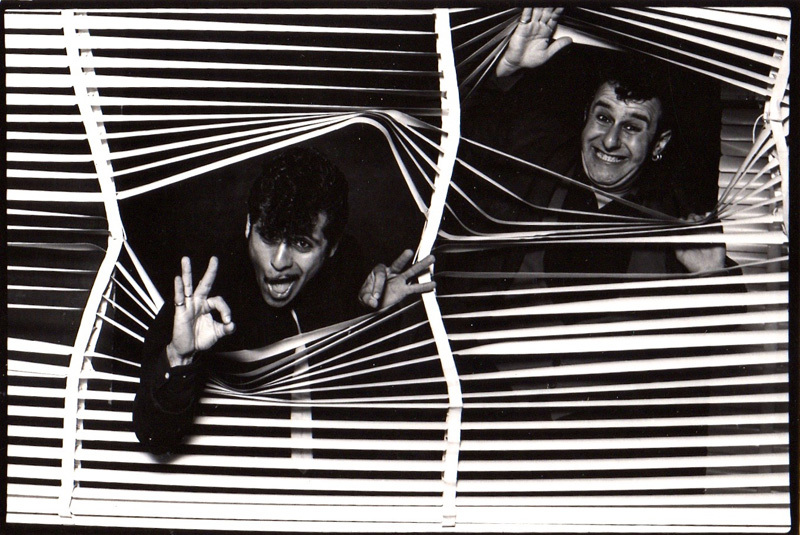 Footnote: All photos taken for the Last laugh and LeJoke were later exhibited at the Lighthouse Gallery in November 1986 as Funny Business – Photographs by Michel Lawrence and were later acquired by the Melbourne Performing Arts Museum. Now thought to be in his 80’s Tommy can no longer walk and has to be helped by his daughter and carer. His work however continues its march to its position at the top of the tree. Tommy is considered a first contact Aboriginal, raised in the traditions of the nomadic desert people before contact with white men. He later worked as a stockman and a labourer before taking up painting around 2001 and has since blossomed into a master of colour and form. 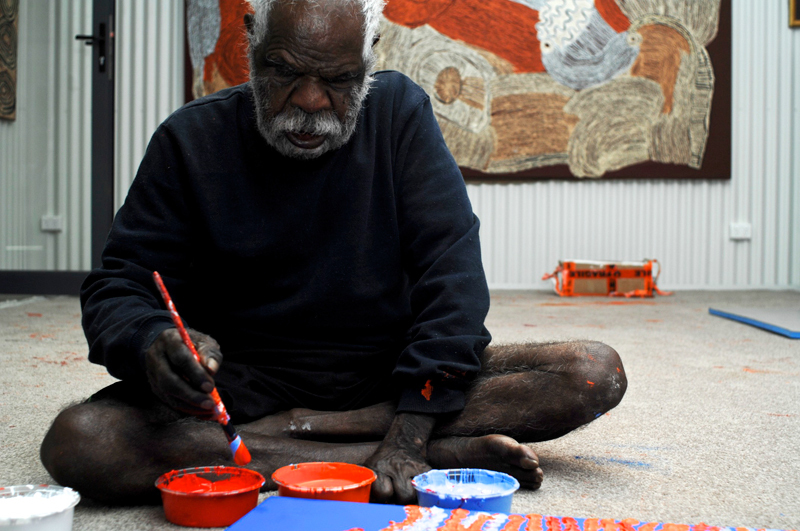 His works feature vibrant blues, oranges and whites, colours that don’t exist in the deserts of Central Australia but have great power and vibrancy. 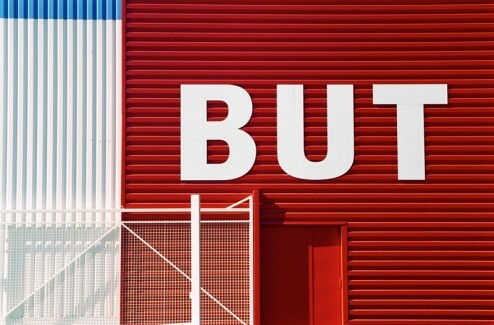 They are more abstract than many of his contemporaries and while using the dot style are not as ordered and patterned as other traditional artists. 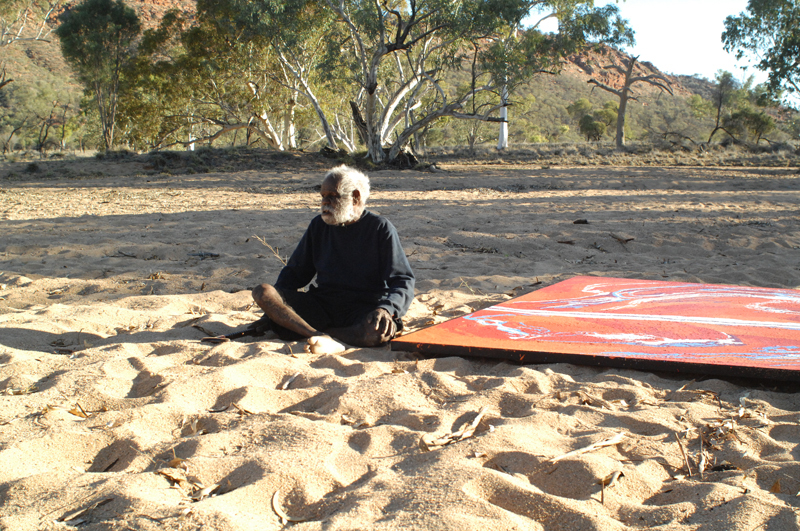 Tommy is now represented by Chris Simon at Yanda Art in Alice Springs and Tommy has been painting on the large 5metre canvasses being produced at Yanda. His works are finding a ready market in Asia and Europe for large sums of money, proving his status as the leading Aboriginal artist. Tommy is pictured with his latest work in the dry creek bed behind Yanda Art in Alice Springs. 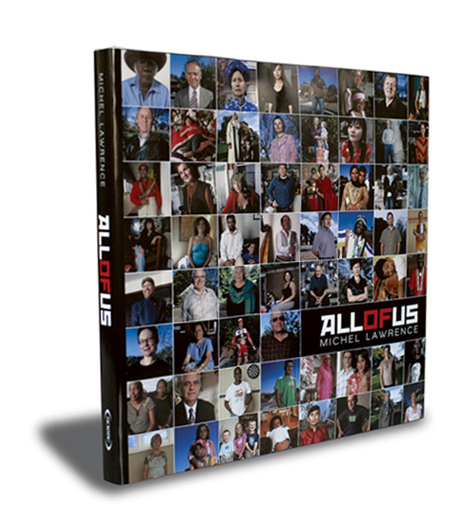 All of us was a simple idea: showcase Australia’s incredibly diverse cultural makeup through portraits of all those Australians who were not born here. 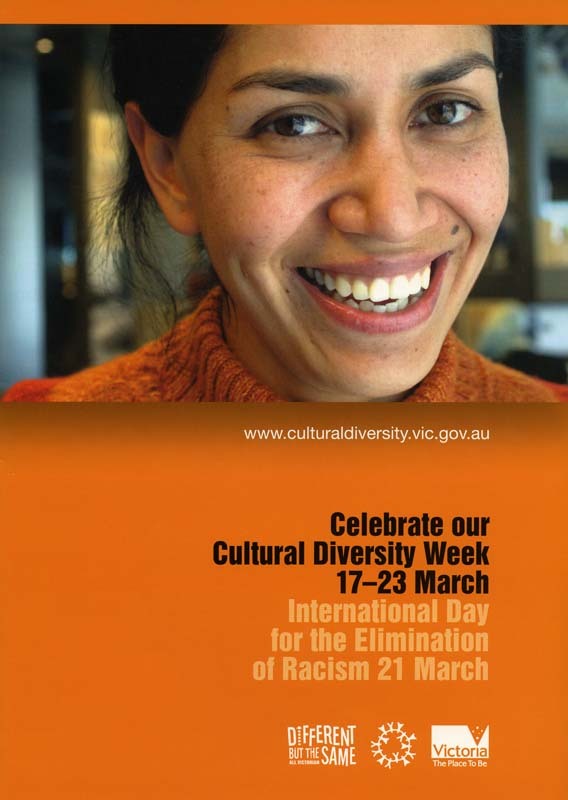 The idea grew from the race riots which occurred at Sydney’s southern beachside suburb of Cronulla in late 2005. 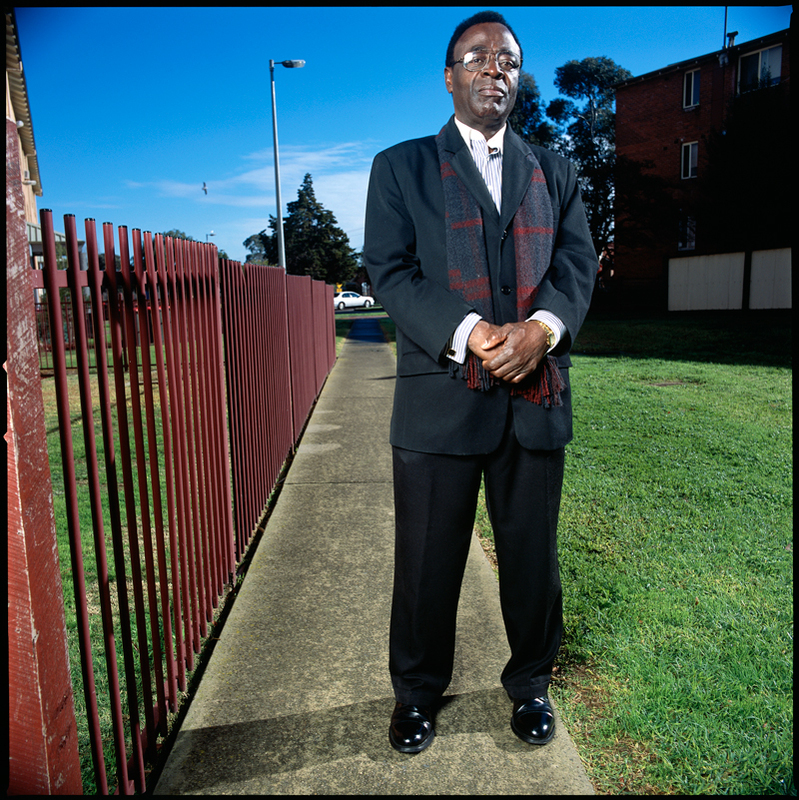 Michel began photographing multicultural Australia in early 2006 with financial assistance from the Victorian Government with the support of the then Premier Steve Bracks and followed by ongoing support from his successor John Brumby. The project garnered support from as number of individuals and foundations along with funding from the Australian Government. 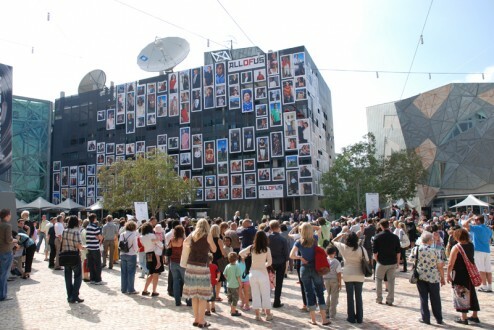 The end result was a major exhibition in Melbourne’s Federation Square for Australia Day 2008, officially launched by Premier Brumby with a book launch at Australian Galleries some two weeks later. The official launch of All of Us at federation Square, Melbourne Australia Day 2008. The exhibition travelled to india in 2010. 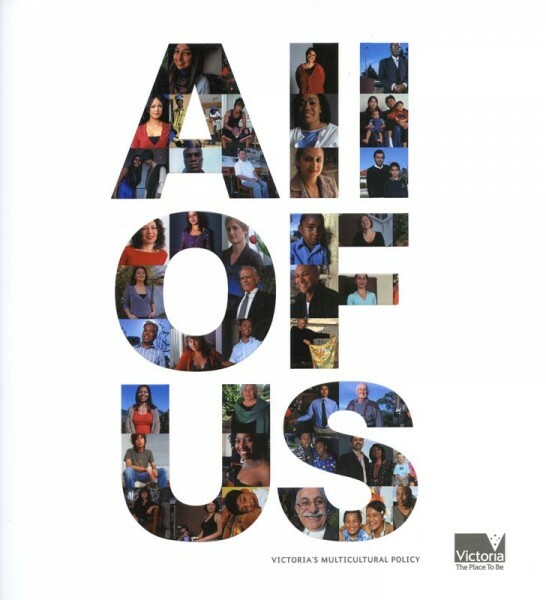 All of Us became a complete package of communications materials- not least as a complete revamp of the VMC website which now houses the photographs from both the All of Us campaign as well as the more recent Indian Aussies. Marketing material for the Victorian Multicultural Commission for Diversity Week. Cover of TimeOut magazine with featured article on All of Us. 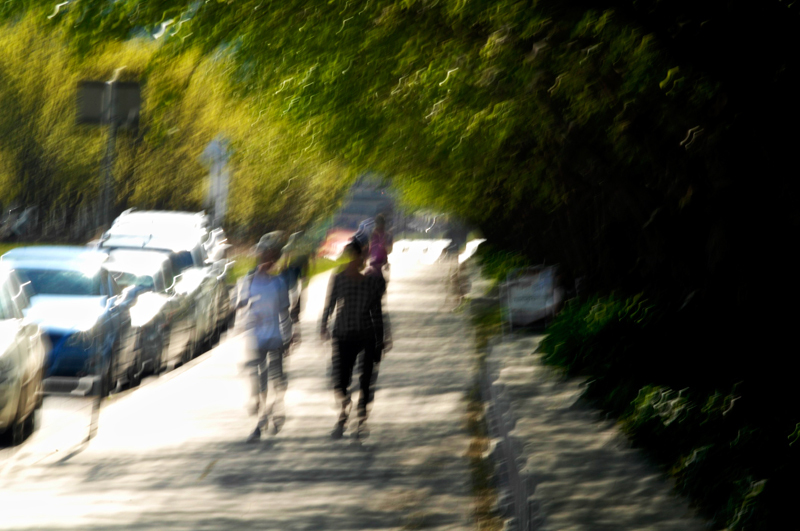 Photography is integral to the web. In fact, a website without photos is almost unimaginable. Michel Lawrence has contributed to a large number of websites over the past decade with a wide range of images from portraits, to automotive to landscape and Still Life. I have a large folio of published work from newspapers and magazines to brochures, booklets and two published books, Framed-Portraits of Australian Painters, published by Hardie Grant and All of Us published by Scribe Books. Sign Language is a long-term project. The photographs are of places and things which with the message in place can sometimes give a completely different meaning to that intended. In some cases there are no words. Michel Lawrence’s portrait of Sid Nolan as Ned Kelly is just one of 100 of Australia’s most prominent painters, sculptors and print-makers photographed over a ten-year period from the mid-1980s until the mid-1990s. 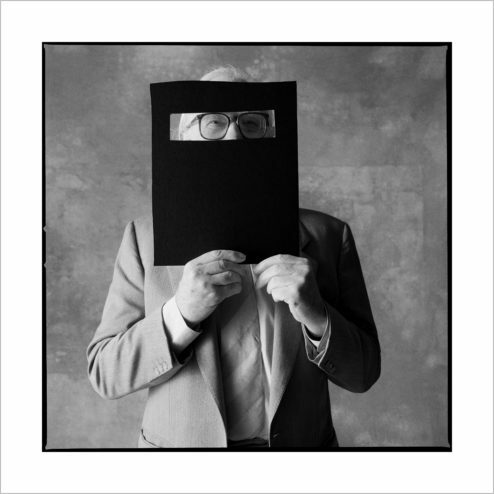 The photographs were exhibited at Australian Galleries Melbourne and Sydney and published as Framed-Portraits of Australian Painters published by Hardie Grant. The book is now out of print but can be found sometimes on Ebay. The photographs are in numerous private and public collections including the National Portrait Gallery in Canberra, The National Library, The Museum of Modern Art at Heide, The Queensland Art Gallery, Melbourne University, numerous regional galleries and a number of private collections. Above: Portrait of Sid Nolan- photographed by Michel Lawrence enjoying himself as Ned Kelly. This photo is in a number of public and private collections most notably at The Museum of Modern Art at Heide, which is where of course, Nolan painted his ground breaking Kelly series. 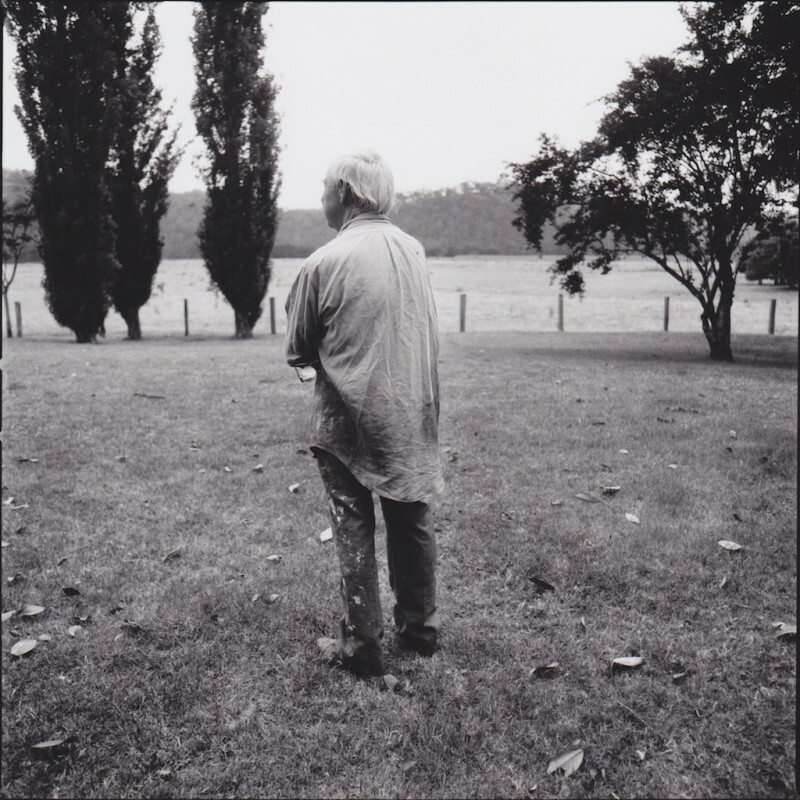 Michel Lawrence photographed Arthur Boyd at Shoalhaven, looking towards the river. 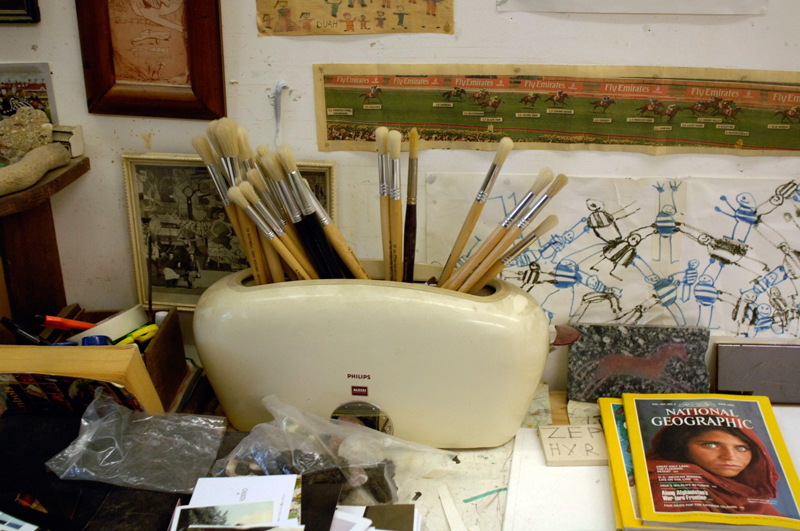 David Larwill in his studio. 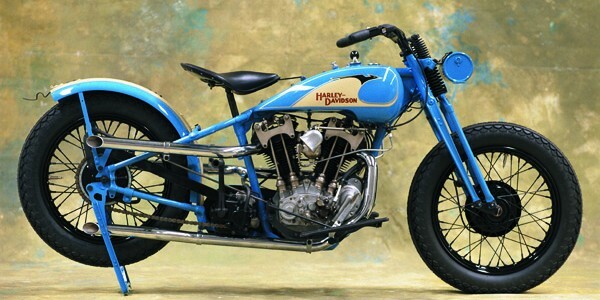 Michel Lawrence has photographed a large number of veteran, vintage and classic Harley Davidson and Indian motorcycles as part of a long-term personal project. 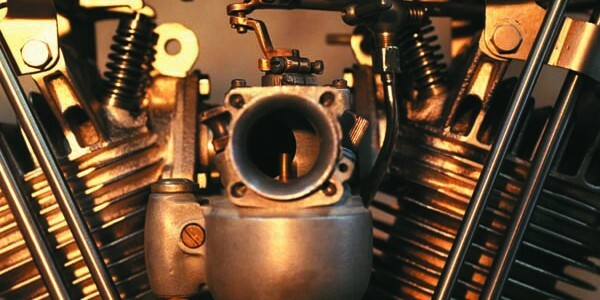 The bikes themselves have their own histories and vary between full restorations and totally original with their own wonderful patina from years of use- and abuse. 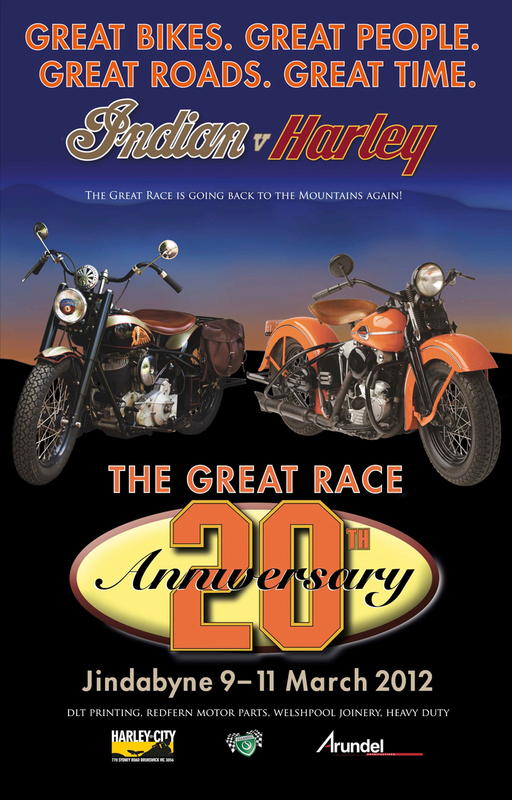 The photographs have been used for a number of posters and events like the annual Harley Vs Indian Great Race. 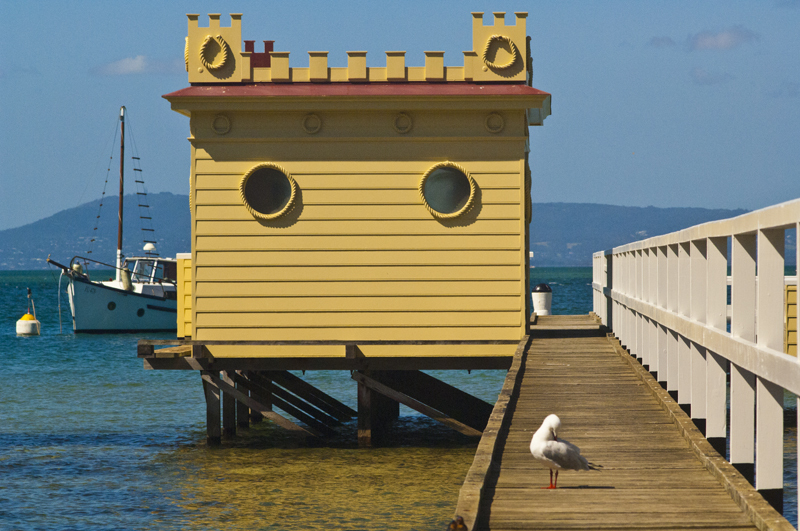 The artist Julian Twigg, well known for his paintings of large container ships uses this 100 year old boathouse as his studio. 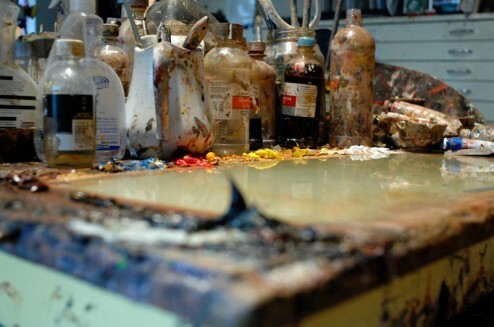 But artists studios are just as varied as the people who inhabit them. Here is a selection of a few studios which fall into the Quite Interesting category!